Time: 02:37:58 Automatic personal record! 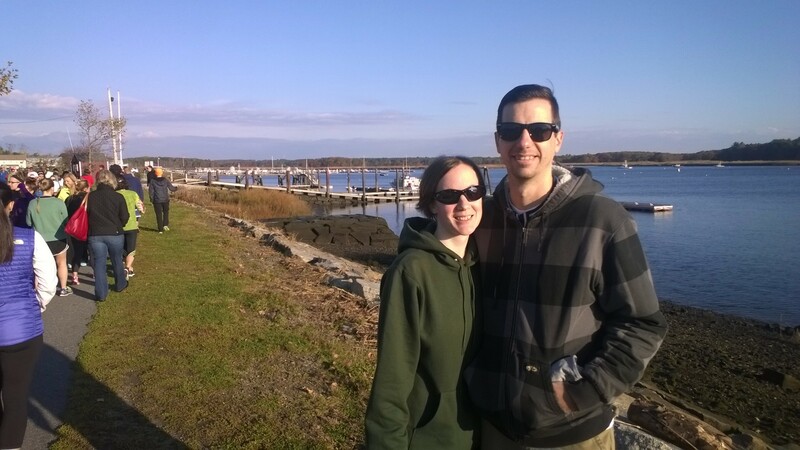 Drew and me posing with the Merrimack River after bib pickup. Green Stride (the race directors) had great communication via email during the week before the race – they laid out all the details, and even offered some encouragement which a nervous first-timer like me really appreciated! 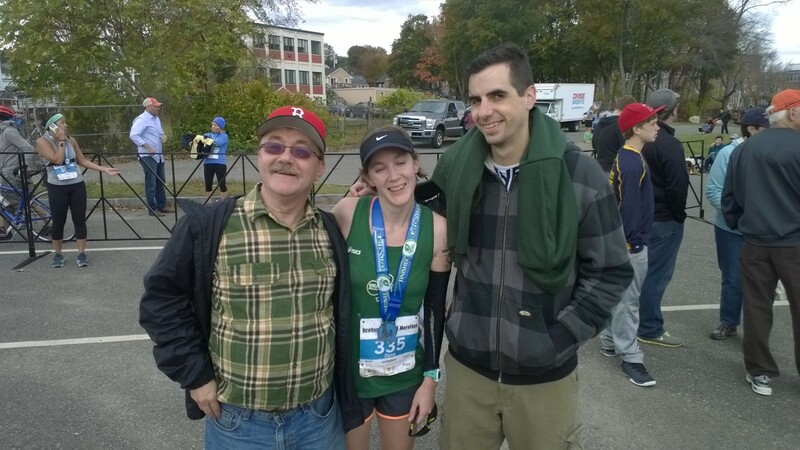 I couldn’t make the bib pickup at the Greater Boston Running Company the day before, so my mini-entourage (me, Drew, and the FIL) left for Newburyport at 7:45 (the race started at 10). We got there just in time to score a parking spot in the public lot closest to the start/finish area, otherwise we would have been looking for street parking. Bib pickup itself was easy and quick at that point in the morning; we had been emailed our bib numbers ahead of time, and pickup was organized by number. With my bib I got I really nice tech t-shirt and a pint glass, which I gave away to another runner who seemed bummed she hadn’t gotten one (our kitchen cupboards are overrun with pint glasses!). It was a little brisk by the river (upper 40s and windy), so we headed back to our car so my southern Californian FIL wouldn’t get too cold. There, in the shelter of the car, I pinned by bib, put on my new patella straps, and Body-Glided my toes (it feels weird but it does its job for me… I got no blisters!). About an hour before gun time I thought I’d scope out the porta-potty situation and start to warm-up. Holy porta-potty lines, Batman!! 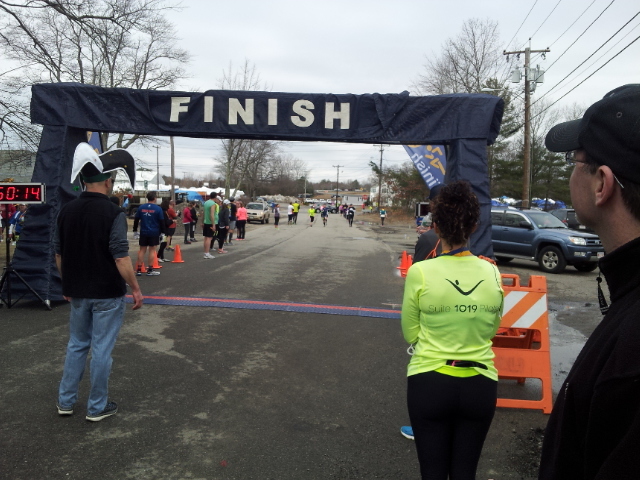 The pre-race emails had said “Unlike other races, there will be no lines for porto-potties at this race…….just kidding!” Having never run a race of this distance before, I had never experienced the insanity of pre-race porta-potty lines. Wow. However, the lines moved quickly and they seemed to be mostly clean and in decent shape. After my porta-potty incident, I only had about 5 minutes to find my pace sign and get situated in the starting area. There was a bit of a crush of people around the barriers by the starting line itself, and I had to squeeze my way through runners and spectators to get down the sidewalk toward the back of the pack. I snagged a spot somewhere between the “10 minutes” and “walkers” signs, and was a little weirded out to find that I didn’t feel nervous at all! I was expecting major nerves but I was strangely calm and it felt a bit anticlimactic, like just any other race. I couldn’t hear the start signal, but the crowd lurched forward, and after a few false starts we were on our way. I had planned to take quick walk breaks every 30 minutes so I could eat a chew and have some water – this fueling tactic had worked well during my last 2 long runs – but I was worried that my lack of a good breakfast would mess me up. (I had made myself a bagel with peanut butter and banana slices, but the bagel was crazy stale and it was mostly inedible. 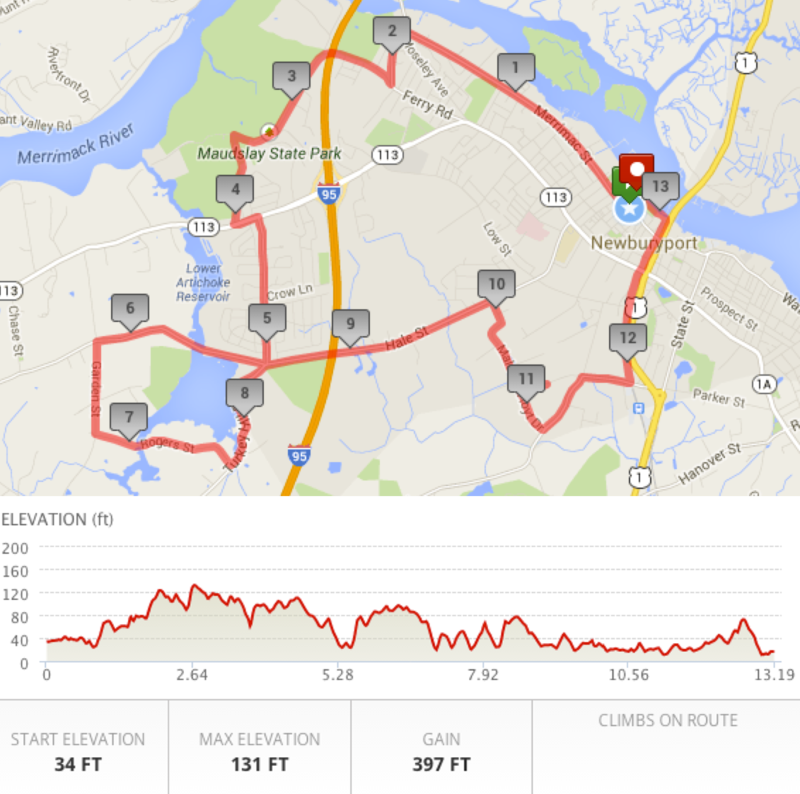 I ate what I could, but it didn’t seem like enough energy to carry me through 13.1 miles!) I stopped to have some chews maybe 2 miles in… it seemed early but I was starting to flag a tiny bit, plus there was a sizeable hill so it was a good opportunity! I was so worried that I wouldn’t have enough energy to make it the whole way. By the time I got to mile 4, I was feeling great again. To be honest, I hadn’t hydrated enough, or warmed up enough, and my breakfast was pathetic, so really I could have probably felt great the whole time but set myself up for weariness. But my mile 4 I was in a groove. 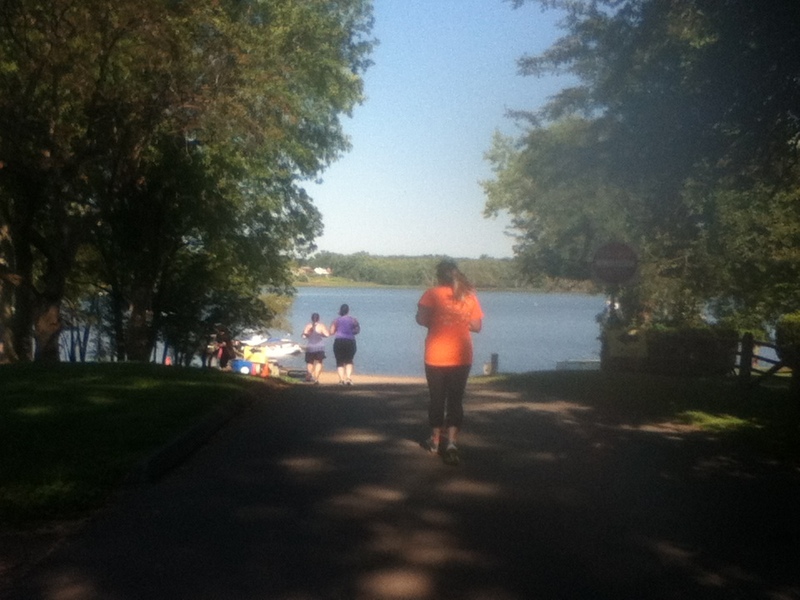 The course took us through a state park, which was all nice and woodsy, and then down along a lake. It was gorgeous, such a scenic route! 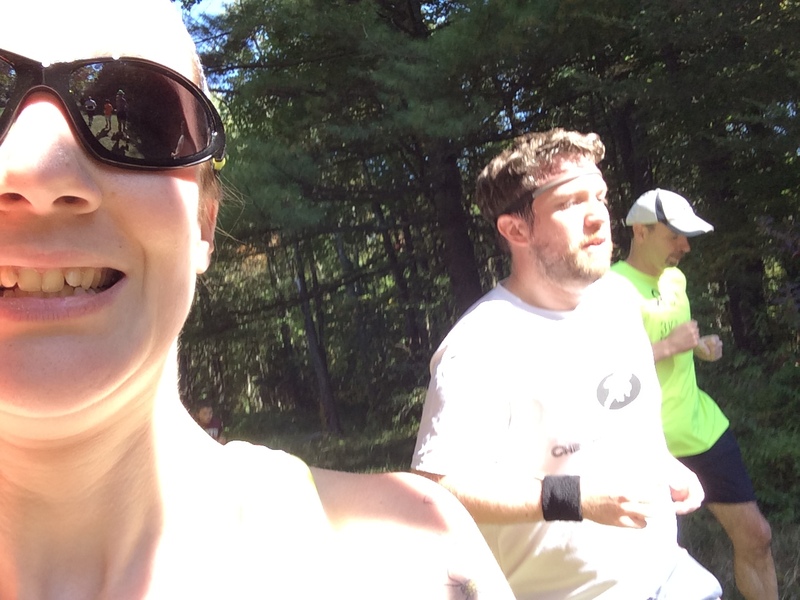 I pulled alongside a guy around mile 5.5 to chat about his run club, the Wormtown Milers (hometown represent!) and spent a few minutes running side by side in companionable silence before I pulled away. 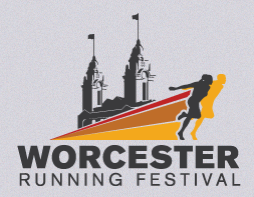 Luckily for me, the race organizers had decided to put 2 porta-potties at each water stop (I somehow missed this vital piece of info in the pre-race emails… if I had seen it, I don’t think I would have had such a weird porta-potty situation before the start!) 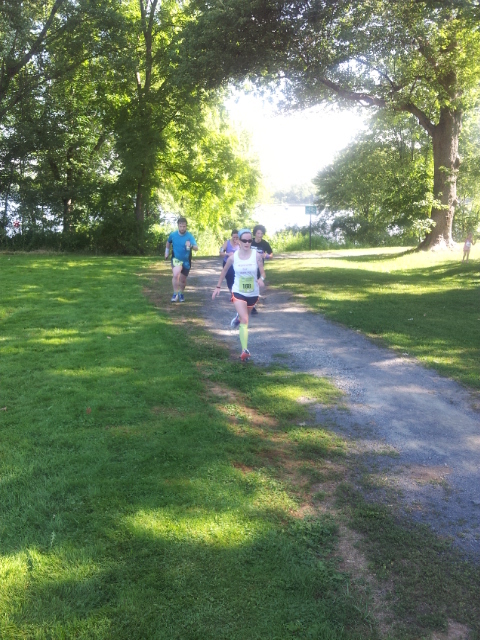 and the ones at mile 7 were perfectly timed. As a bonus, they were the first ones to not have a line! And, considering how far back in the pack I was, the one I used was as immaculately clean as a porta-potty can be. Probably more TMI, but I was so happy about that porta-potty and set off happily once again, enjoying the rolling farmland on either side of the street. My happiness didn’t last long, though. By mile 7.5 or 8, I started questioning why I was running a half marathon. The sun, which had been out for the first half of the race, had gone behind clouds and the wind off the lake picked up pretty strong. 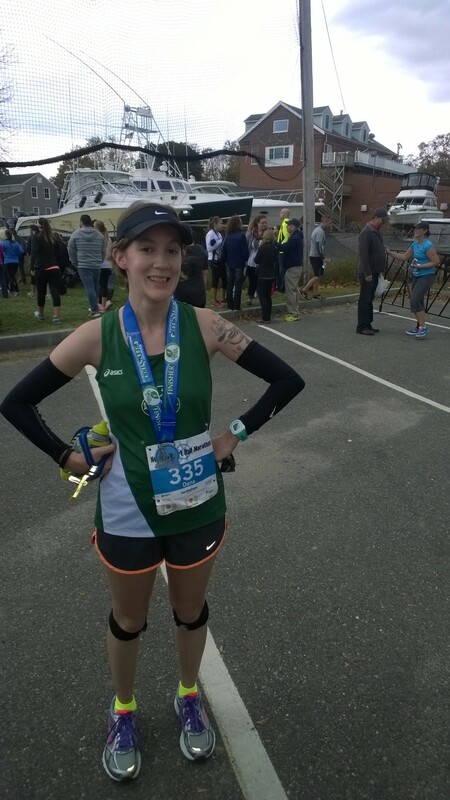 (I was so glad I had worn arm warmers – I had a whole debate with myself beforehand about what to wear, because I get really warm after running a short distance so I didn’t want too many layers – because that wind was chilly!) The pack had thinned out by this point too, and I was alone for a few stretches. 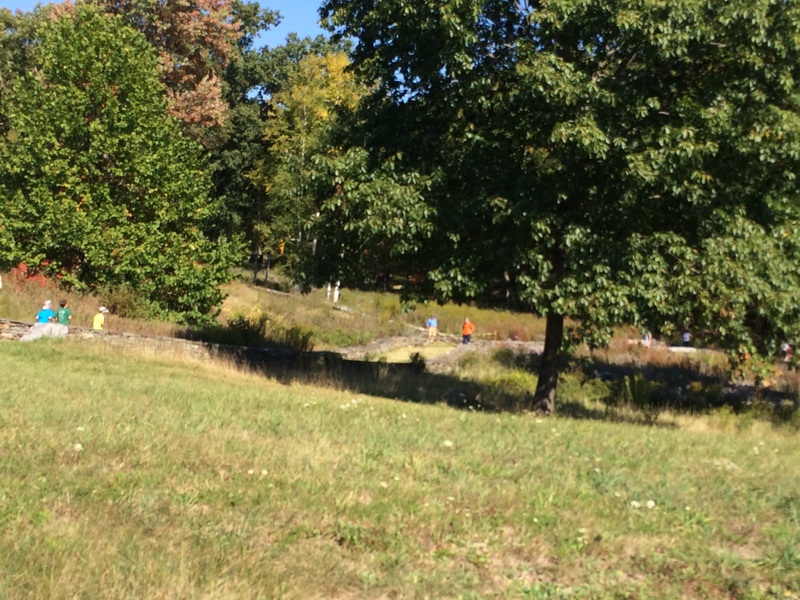 The start/end of the loop in West Newbury, where runners around miles 5 and 8 passed each other, and which had had tons of screaming spectators when I was at mile 5, was pretty much abandoned as I came back for mile 8. I still felt strong enough, but mentally was questioning my sanity for having signed up for this thing in the first place. After running across the bridge back over I-95, the course spent a few miles going through industrial parks. 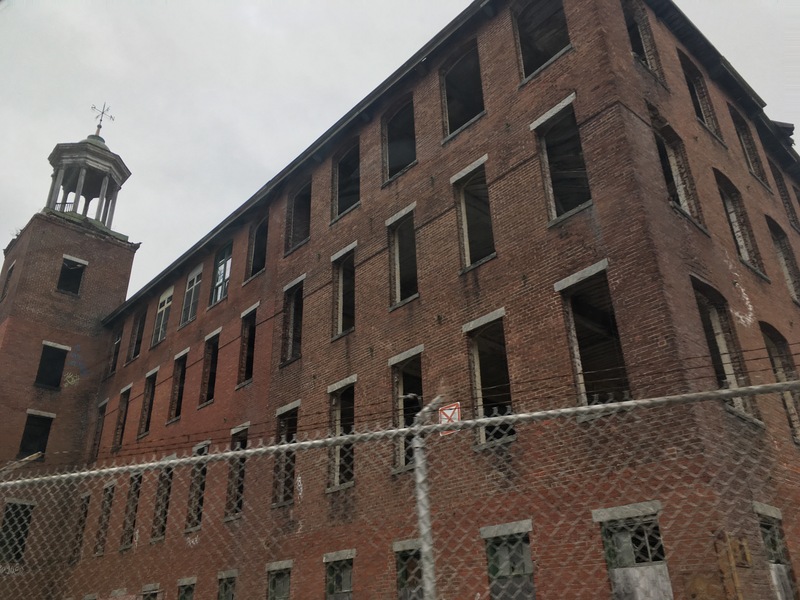 After the supportive spectators and gorgeous scenery of old houses, forest, and lakes in the first half, this abrupt change to abandoned roads and buildings did not help my mood much. On the plus side though, it was flat! The pre-race emails had mentioned a change in course from previous years that removed some hills… I’m guessing the random detour around mile 11 which took us down a street only to turn around halfway and run back was part of that change to make up distance. I was still mentally bummed out, and even telling myself “Hey! Only a 5K left!” at mile 10 just served to depress me further. 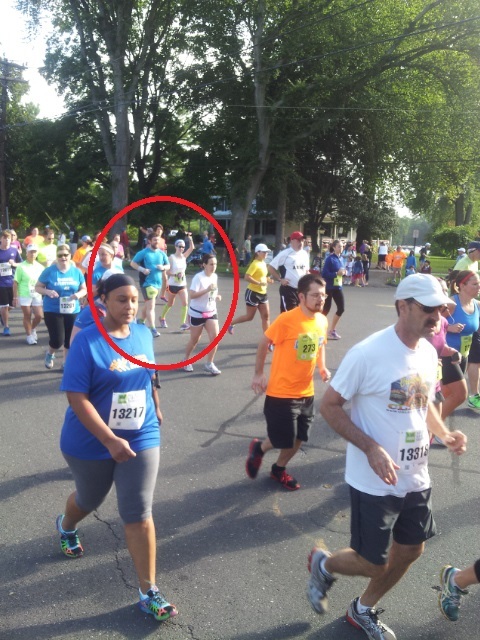 At about mile 11.5, however, I started kicking that Negative Nelly to the curb… except I pictured it as the Blerch! Yes, I was a champ who needed her rest, but the nap I so badly wanted would have to wait until I was done running. 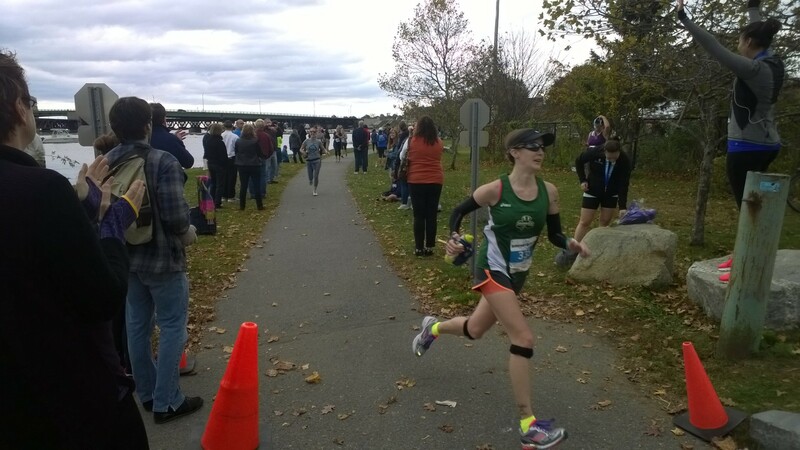 I tuned out my Blerchiness and steeled myself to finish strong. I took one last walk break at about 11.75 miles, ate a few last chews, shook out and adjusted my posture, and away I went. 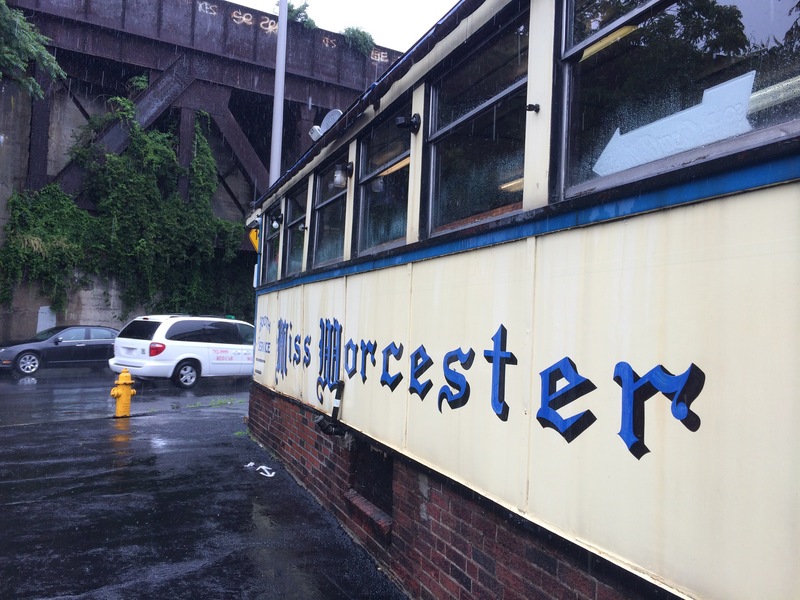 It was a good time to steel myself, because I was rewarded with another abrupt change in scenery; the course took a turn onto the Clipper City Rail Trail, a paved-over old railway line which was dotted with sculptures and turned into the Harborwalk, which was part boardwalk and part paved trail. Something magical happened to me on that trail… I reached the point where I felt like I couldn’t stop if I tried, and, knowing how close to the end I was, I started to pick up speed so I could finish quicker. My body felt like a machine and I lost count of how many people I passed. I stopped giving goofy thumbs-ups to the photographers, as I had been doing the whole race, and just focused on getting to the finish line. However, she decided she wanted to meander her way across the front of the finish line to cross closer to the right side, and I ended up having to slow down so that I wouldn’t crash into her. What the heck, wandering lady?! Totally killed my buzz for a moment there. Did she hear me approaching and was trying to block me from beating her? Or was she just oblivious, since she was wearing headphones, and didn’t realize she was blocking me? Either way, annoying. That annoyance disappeared in milliseconds however, as I crossed the finish line and heard the PA guy say “Dana, you have arrived!” Hells yeah!! 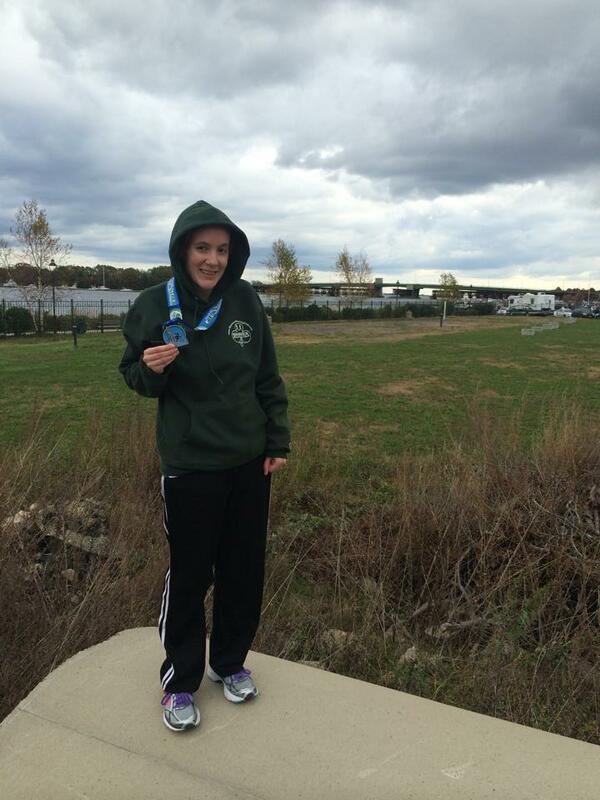 I ran a half marathon!! Finally the photo session stopped, my dad found me a bottle of water, and I stood tottering on my feet as everything sunk in. I had just run (and walked a bit) 13.1 miles! I had just totally killed the last bit of the race! 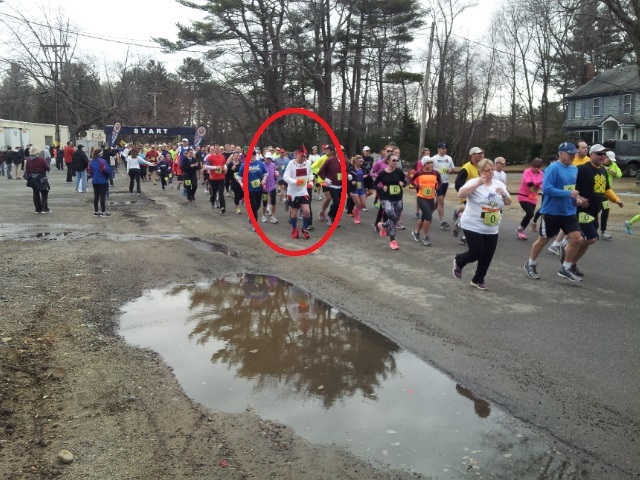 My body became a machine at mile 12! I also kept thinking about how tired I was and how I never wanted to run that far again. The dads had snagged a table at the cafe (which stayed open well past 3 to accommodate all the runners, which was above and beyond! 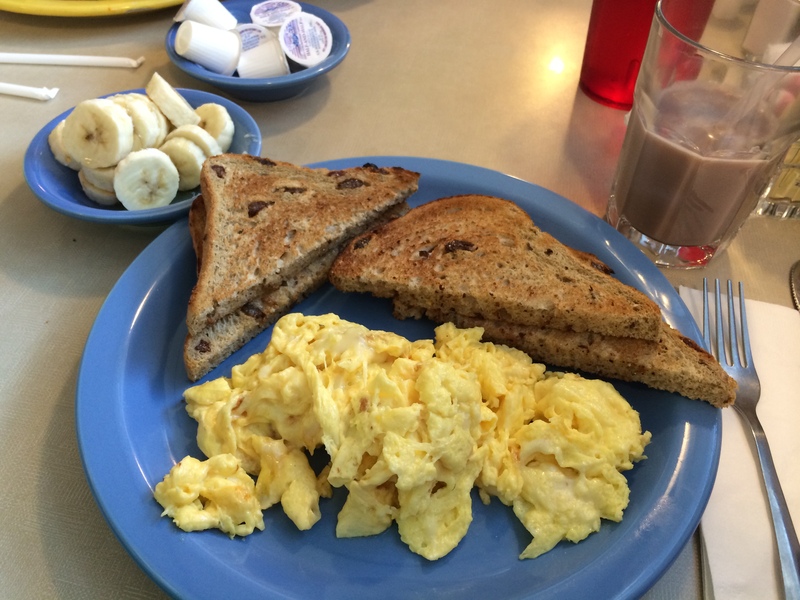 ), I changed out of my cold, sweaty running clothes, and enjoyed a late breakfast of scrambled eggs, a banana pancake, and chocolate milk. Thank you so much to the Riverside Cafe staff for feeding and sheltering us when you could have gone home! It’s still a little mind-blowing that I managed to complete a half marathon, especially when I think about how I could still barely run a mile less than 2 years ago. Thank you to my blog buddies for all your support and advice along the way! 😀 Even though I promised myself while running this race that I would never run another half again, I’m already starting to reconsider… I kind of want to see if my body will go all runner-machine on me again! That felt pretty cool. Sigh, such is our fickle, running way! 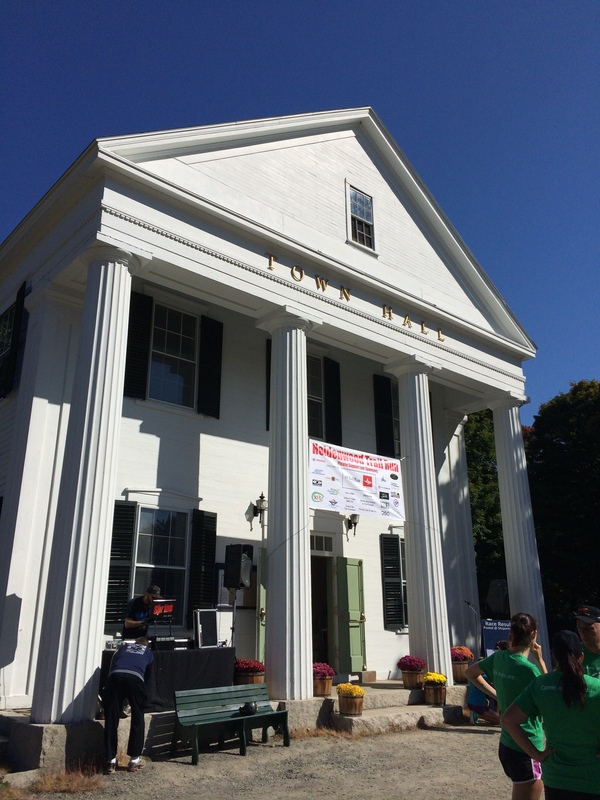 Registration, bib pickup, and general merriment were all held in and around the old Town Hall in Shirley Center. 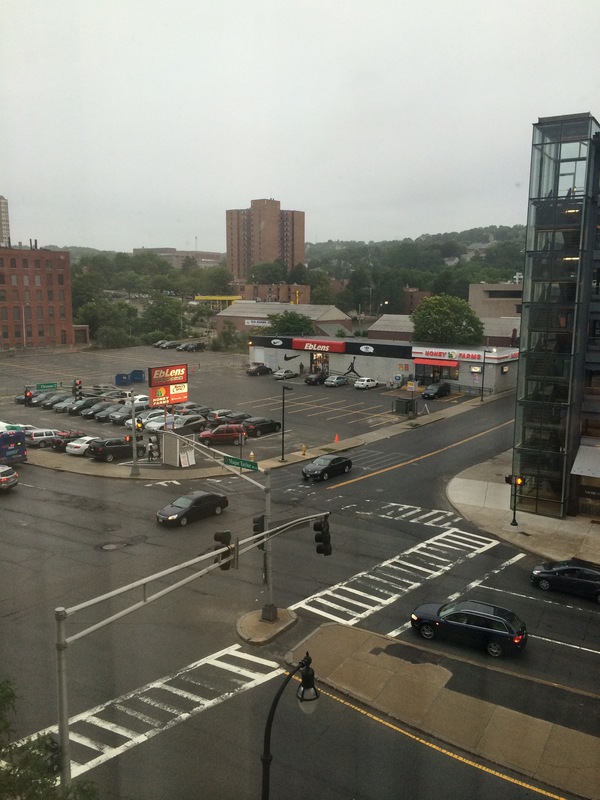 As you can see from the photo, parking was on-site as well. 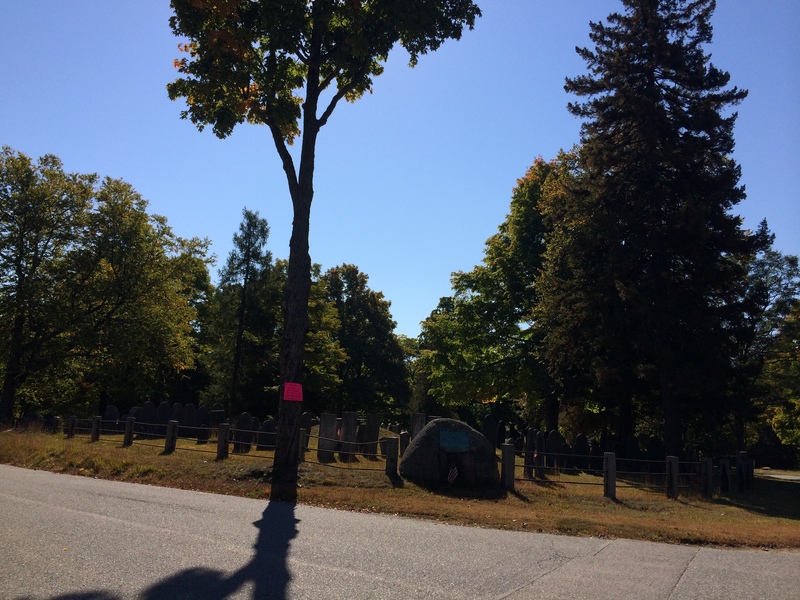 The center of Shirley is very historic and cool, with an old church and this neat old graveyard. 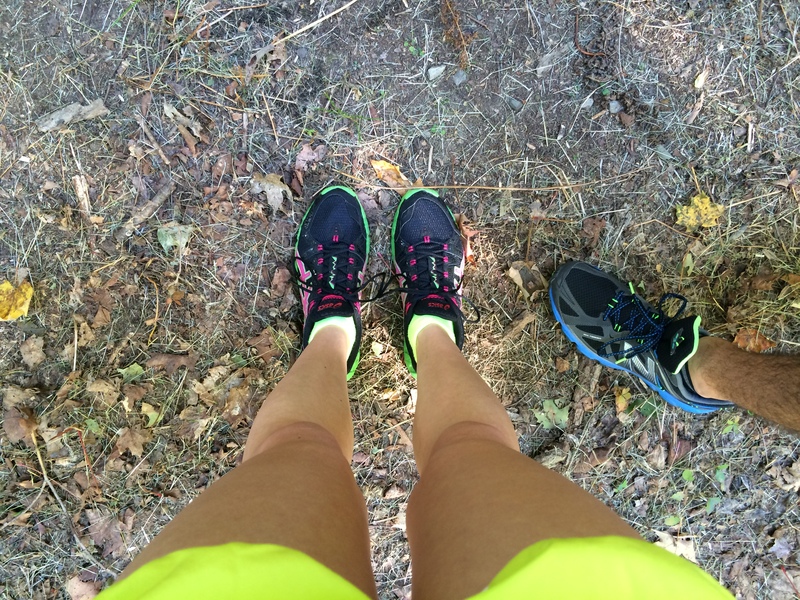 I was excited to race-christen my trail running shoes! 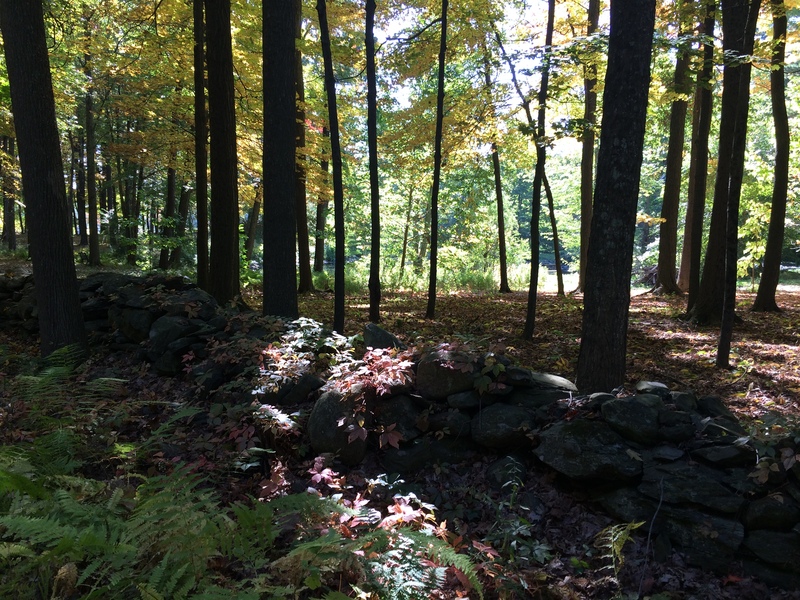 The scenery for this race was pretty gorgeous and very New England – old stone walls, woods, fall foliage… just lovely. We wrongly expected the majority of the race to be in the woods. These bits out in the open were incredibly hot and dusty! Mid-stride selfie of me being excited to run with Drew! 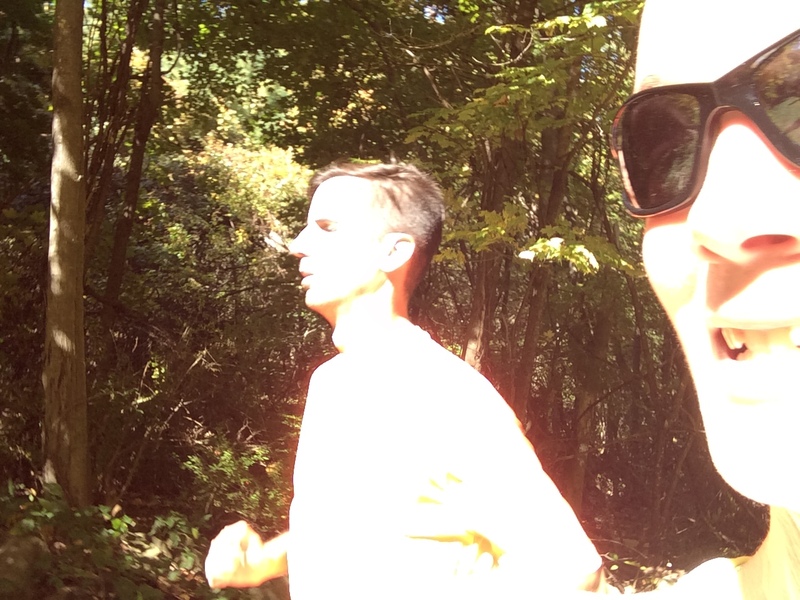 And can’t forget Colin… I love running with him too! In addition to the unexpected amounts of sun, there was an unexpected amount of hills. I did not like it. I did, however, enjoy the changing leaves. It’s not a great picture, but there was an adorable little stone bridge we ran over, right in the center of the photo. 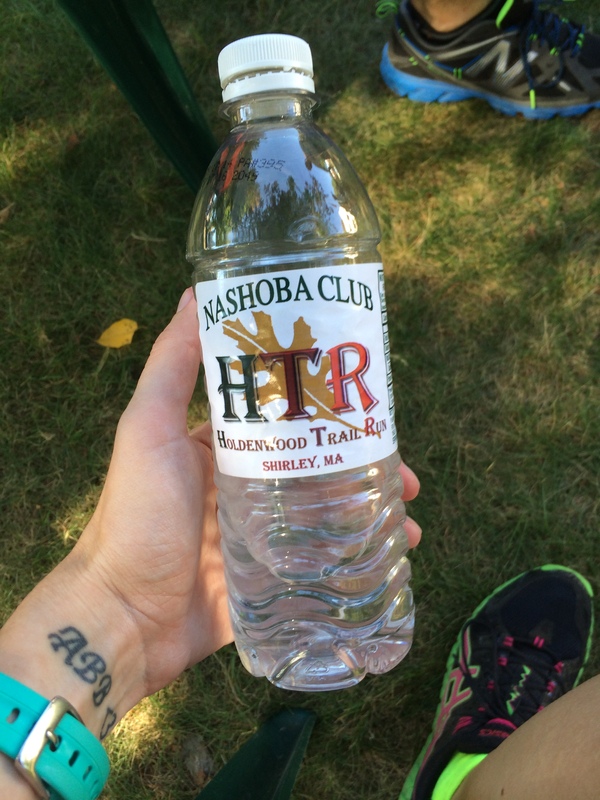 This race was so fancy it had its own water. Once again, having an “elite” bib number did nothing to help my performance! 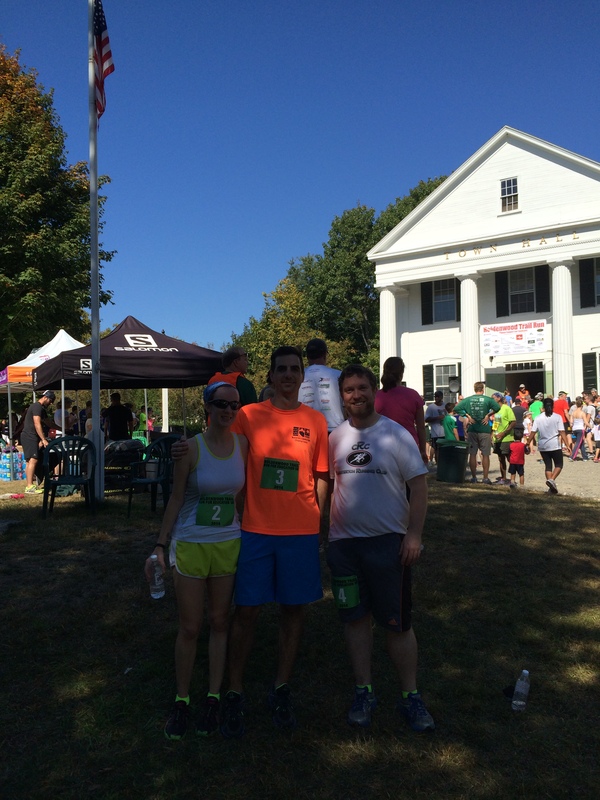 Recap: The Holdenwood Trail Run (HTR) was yet another race that I had signed up for AGES ago, which can be evidenced by our race numbers in that last photo (2, 3, and 4)! When Drew and I first started trying out trail running, I thought it would be fun to do a trail race together, since he comes to cheer at all my road races but can’t run with me because of his dodgy feet/ankles/knees. I remember doing a google search for trail races in the area and coming across information about last year’s HTR, and liking them on facebook so that I could be notified when registration for this year’s race opened up. Clearly I was one of the first to register! Colin also decided to run with us to give trail running a go. The morning of the race, parking was an absolute breeze. The email that had gone out a few days beforehand stressed carpooling and made it sound like they’d run out of space, but it looked like everyone made out okay. There was a 2K at 10am, and the 5K and 10K both started at 11. We got there around 9:30, as registration and packet pickup only went until 10, and we got a parking spot on-site no problem. There were a lot of volunteers to direct people and the whole parking situation seemed to go (to me, anyway) without a hitch. Packet pickup was also nice and easy. All the bibs and swag were upstairs in the old Town Hall (such a cool old building!) and there were many smiling, helpful volunteers on hand to make everything go smoothly. We got our bibs, and because we were some of the first 200 people to sign up, we each got a nice, long-sleeved tech shirt and a running cap. The pre-race emails had warned that there would be no gear check (unless we wanted to tuck our swag and other belongings into crevices in the stone walls) but since everyone’s cars were right there, that didn’t seem to be a problem either. There were 3 porta-potties, as well as two real bathrooms inside the Town Hall (always a nice option!) for just about 500 runners. The 2K started promptly at 10, and the three of us stood just a bit away from the finish line so we could watch. There were a TON of kids at this race (makes sense, as it was a fundraiser for the local school and it was advertised as a race for the whole family) and many of the kids ran the 2K. The runner who won overall was 11 years old! He absolutely flew that course, finishing in 8:04 (a 6:30 pace). 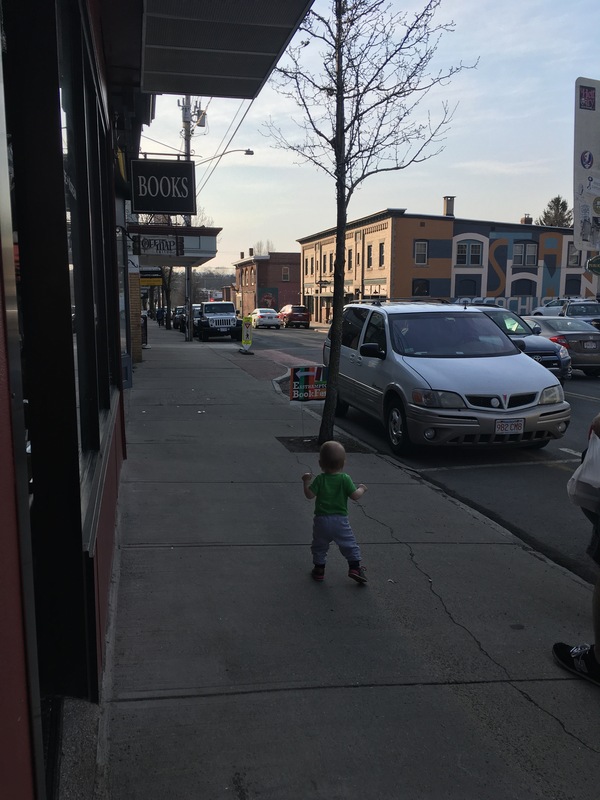 It made me wonder how I would have done in a similar race at that age… that was back when I still loved running and ran everywhere I could… oh, how I wish I had that kind of energy again! Before the 5K and 10K started, something very cool happened. A runner and well-known community member, Donn Hill, had sadly passed away earlier in the year. 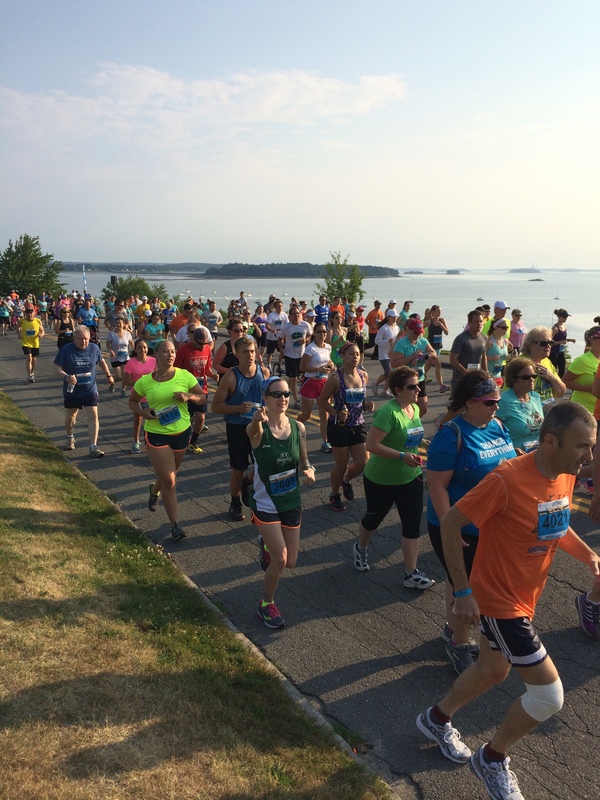 The HTR organizers named the 10K portion of the race after him, and – as Mr. Hill had often played the piano at the local restaurant/bar – held a pre-race sing-along in his memory. They played a recording of Mr. Hill playing the piano over the PA and we all sang, fittingly, Billy Joel’s “Piano Man.” It was so cool to stand together and sing with a bunch of runners, and to see how closely knit the Shirley/Ayer community is. Some of Mr. Hill’s family were there, with their arms around each other, singing their hearts out and, even though I never knew Mr. Hill, I did get a bit teared-up at all the emotion. I think every race should start with a hearty sing-along! Courtesy of the awesome Maybe Marathoner! 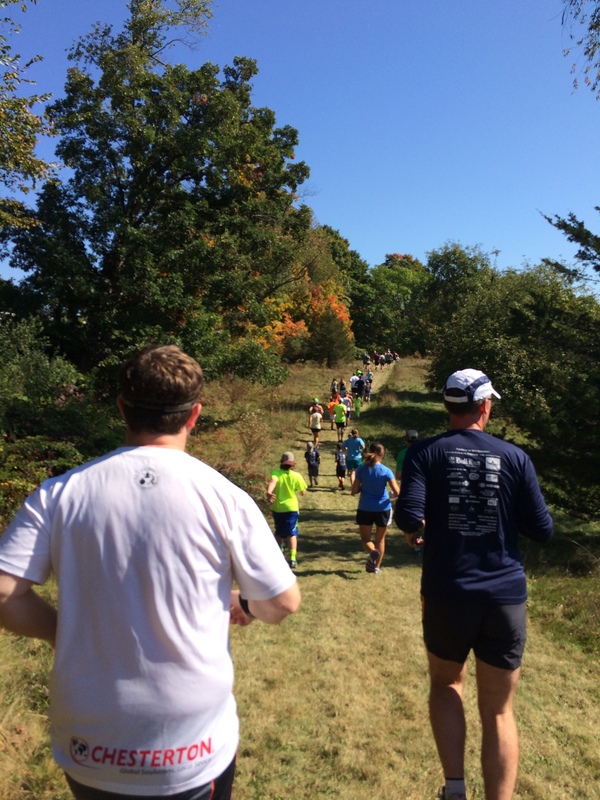 … which meant that we were near the bottom of a small hill that we had to run/walk up to get to the start line. There was a good 10 minutes or so of standing around before the starting horn blasted, and oh man, was it hot! I was really wishing I hadn’t stashed my shiny new running cap in the car, because yikes, it was bright and my face felt like it was roasting. When we finally got underway we went at a pretty decent clip, at least once we got around all the walkers or people who took early walk breaks. Drew tends to run at a faster pace than Colin or I but, as I like to remind him as I huff and puff alongside him during trail runs wanting to keel over, he usually doesn’t run as far so he doesn’t really think about pacing himself. Apart from 2-ish-mile trail run jaunts back in the early summer, or the few Shammies speed workouts he’s joined me at, the only running he really does is during half-field soccer games, and really that’s sprinting. So anyway, we took off at his speed, and I was so distracted by getting around people and by the novelty of running on a trail with a bunch of other people that I didn’t notice our speed or just how many little (and not so little!) hills we were tearing up, and then tearing back down. This soon caught up with me and it was not pretty. 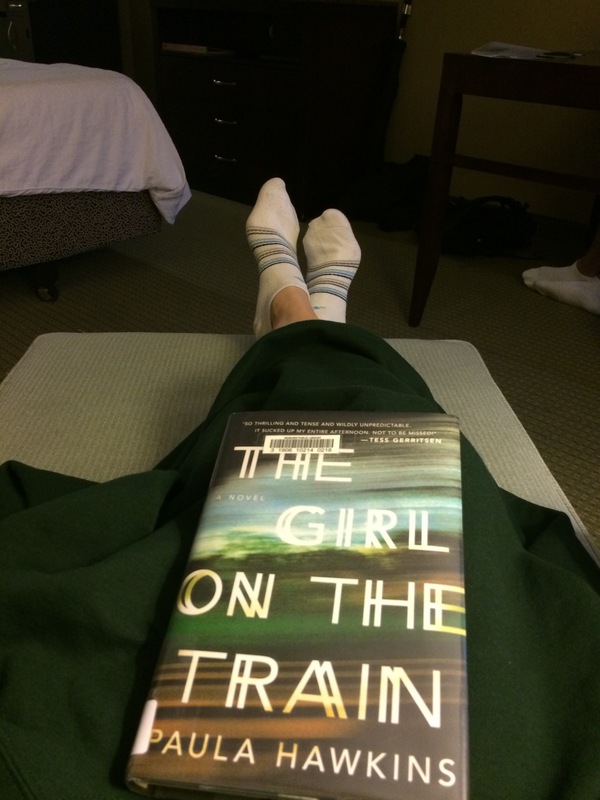 In my last Weekend Wrap-Up, I mentioned how during the week I had experienced a weird combination of light-headedness and heart pounding… well I had also been overheating and suffering from weird chest discomfort (not to worry, I went to the doctor and apparently it’s just an epic case of indigestion). Well, I hadn’t been worrying about that when I thought the race would be a nice, leisurely ramble through the woods. But, factor in a) the heat and running in the midday sun, b) the inadequate amount of fuel in my body because I hadn’t been eating right all week (due to said indigestion problems) and only had a tiny bagel with peanut butter at 8:30 and forgot to eat my energy-boosting chews before the race started 2 1/2 hours later, and c) I probably hadn’t hydrated enough because, let’s be honest, I’m crap at doing that step properly… and all of a sudden thanks to all the hills and the fast pace and the sun, all I could think about was the heart about to explode in my chest and the redness of my face about to burst. I didn’t like that sensation. I gave up halfway up a hill and told the lads they could carry on. They’re both good sports and said they’d stick with me, and they did, but I ended up walking (and making them walk) probably half the race. Not only was I terrified that I was going to have a heart attack, and not only did my legs refuse to run up another hill, but I also had my stomach start to rebel against me. It was one of those situations where I felt like if I ran another step I would totally be That Runner Who Pooed Herself during the race, and I didn’t want to be That Runner. So I’d walk up the hills, walk a little farther until I could catch my breath, try to run for a bit, then have to pull up and walk again for fear my colon would blow. It wasn’t fun. Plus I felt like I was totally ruining Drew’s first real 5K, as well as ruining Colin’s race, and I kept apologizing on top of whining and I’m sure I wasn’t everyone’s favorite running companion that morning. 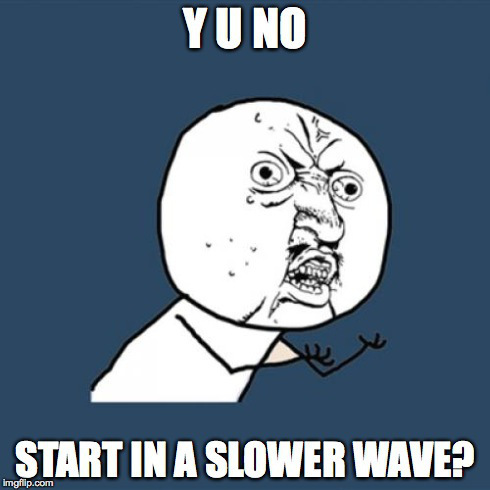 To make matters worse, the fast 10K runners were starting to lap us. I think all the high school cross-country runners from the area were competing in the race, and dear Lord they’re fast. I’m not sure what was more disheartening – to have the 10Kers pass me after I had only run like half the race, or to have the 5Kers who had already finished walk back past us and say “Looking good guys, you’re almost done.” (Clearly I wasn’t looking very good, and all I wanted was to lie down!) The one bright spot, apart from the one water stop which was GLORIOUS, was a pack of three girls who were probably 8 or 9 and who had designated themselves cheerleaders. 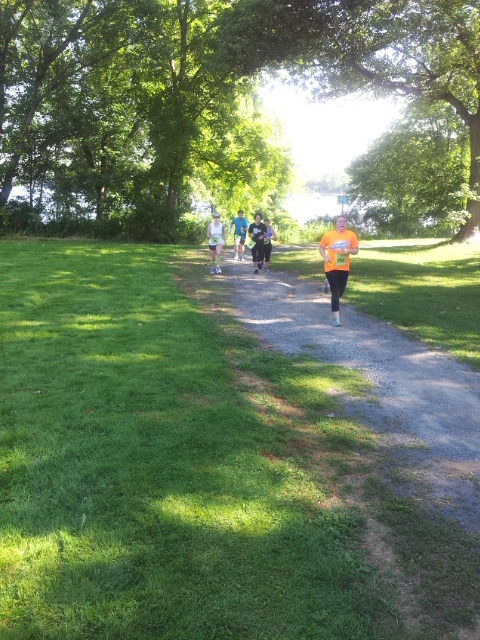 As I limped my way closer to them, one of them yelled “Be positive and believe in yourself! !” It was adorable, and it made me run faster, which then made me double over in pain a few steps later. Let me just say that it was such an unbelievable relief to see the finish line, and I was able to run faster (not quite sprint, because the cross-country 10Kers were barreling down at us and I didn’t want to get in their way) and finish the race strong-ish, at least for the last 100 yards. I went through the chute and turned and marched straight up to the girl handing out water, and then all but collapsed into a plastic lawn chair in some shade. Drew ran to grab me my chews, then bought a bag of pretzels to help bring my sodium levels up in case that’s what was causing the tummy trouble. My stomach improved, but emotionally I felt miserable. Before the race we brazenly had figured we’d finish in about a half-hour, giving us plenty of time to stop at the nearby diner which closes at 1. 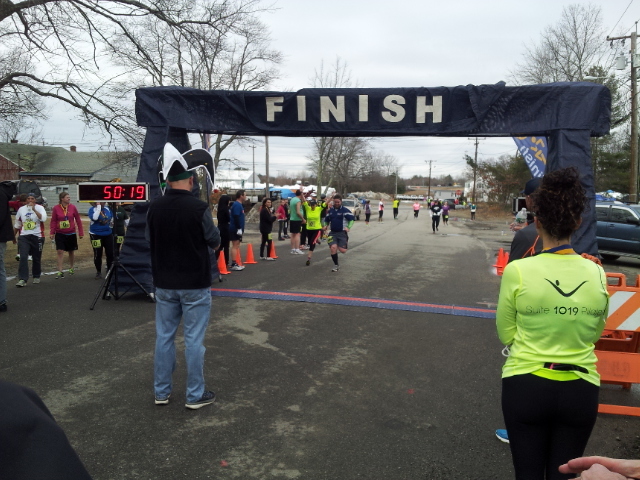 Instead, we finished in just over 42 minutes, my slowest running 5K time in a long time, and I had been uncomfortable and whiny for almost the whole thing. In short, I did not enjoy the race at all! It might have been the worst I’ve ever felt in a race, which is too bad because the race itself was quite lovely. 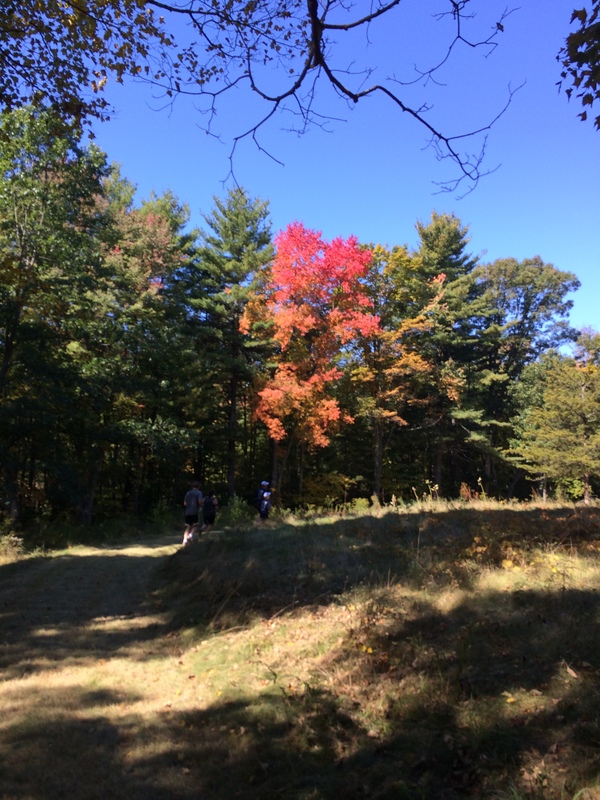 The trails were well kept, the course was well marked, the volunteers were awesome, and the scenery would have been even lovelier if I hadn’t been running like a hunchback and staring at my feet for most of it. I wish I had looked up the course beforehand, because I naively assumed it would be an easy one (despite the website saying “For those seeking a running challenge, the rolling hills and steep traverses will not disappoint!”). At least then I would have expected the hills! I would like to run this race again next year, properly fueled and with a better idea of the course, to see if it goes better the second time around. It’s a shame my stupid body had to mess with an otherwise great race, but the day was rescued thanks to a yummy diner, a family birthday party, and two running partners who are very patient and kind. Cheers, Drew and Colin! Hopefully the next one will go better! Time: 01:14:52 Automatic personal record! 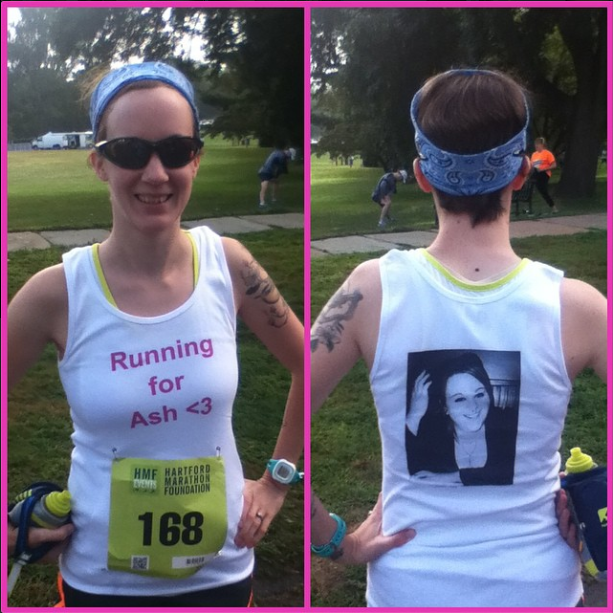 As I wrote about a month or so ago, I ran this race in honor/memory of my cousin Ashley. Here I model the shirt I made before the start. Colin and I start the race toward the back of the pack. There were a lot of runners and the roads were pretty congested for the first lap. Race swag. No bling, no goodies, just the shirt, which reminded me of Blackpool’s old kit, and which promptly unraveled after one wash. Boo. This was a race with a lot of build-up! 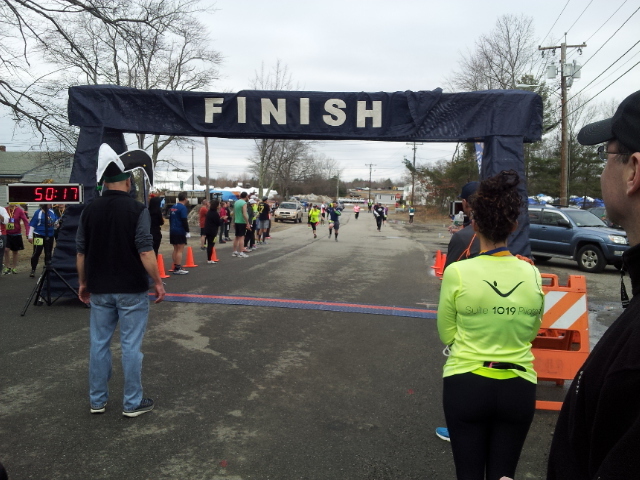 I found the Old Wethersfield race back in February or March when I was looking for races that benefited mental health/addiction charities (like InterCommunity), and there was so much anticipation to running my first 10K that I started having stress dreams in the days before the race. After lots of support and encouragement from my fellow bloggers (thanks everyone! 🙂 ) I was able to calm down and race day arrived without too much panic. 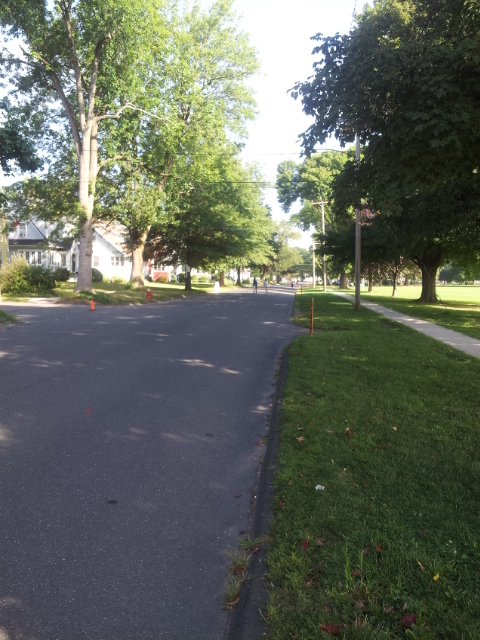 You can read about my experience tooling around Wethersfield the day before the race here. The race was scheduled to start at 8:30am, so after a fabulous complimentary breakfast at our hotel – Hampton Inn Rocky Hill, which offered the best free breakfast I’ve ever seen at a hotel… at least in terms of what I want to eat before a race! – we headed over to Cove Park to pick up our bibs. The packet pickup area was super organized and fast; each volunteer had a computer to look up names, so we didn’t have to line up by last name or know our bib numbers beforehand. 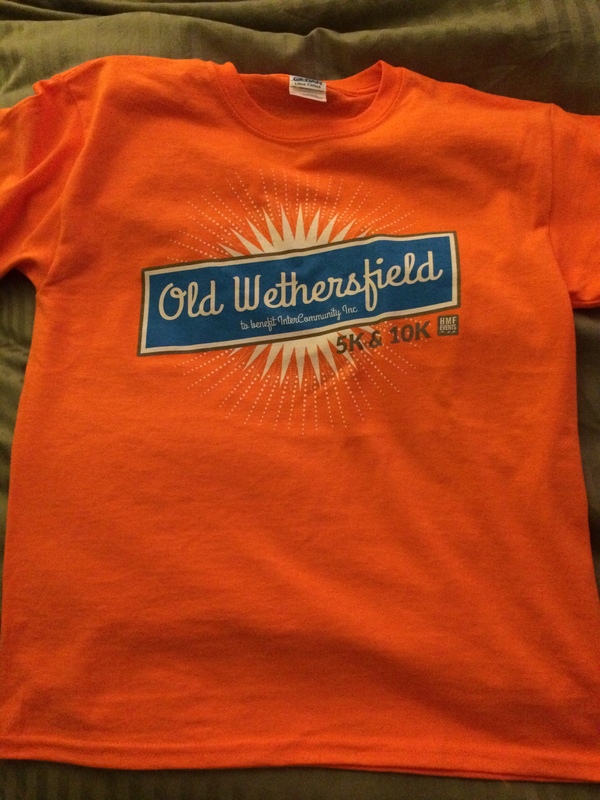 After getting our bibs – white for 5K and green for 10K – we were directed over to the t-shirt table to get our swag. Colin and I did our warmups – some slightly-faster-than-our-slow-race-pace jogging and dynamic stretches – and then followed the sea of people to the starting line. 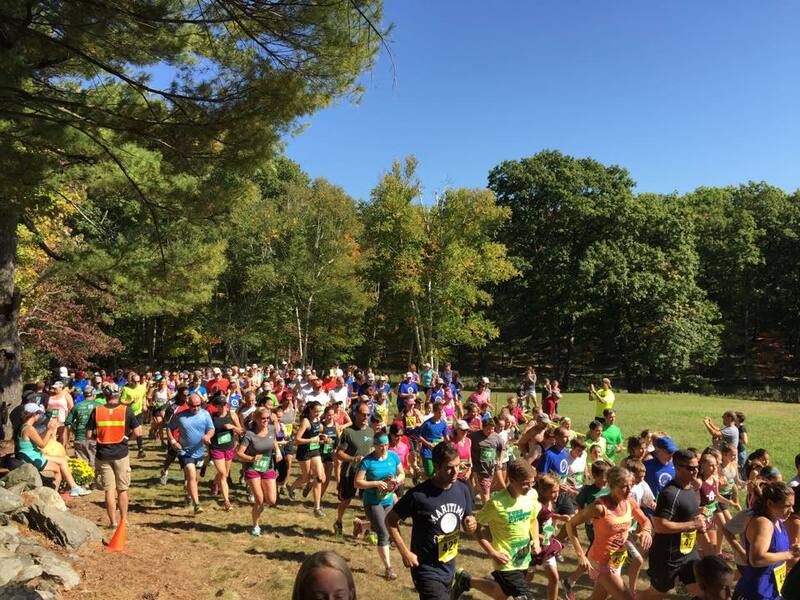 There were (according to the results list) just under 500 people running the 5K and 615 running the 10K. We waited maybe 10-15 minutes for the starting gun, and during that time Colin was feeling like he should keep moving/stretching. He started doing a hip flexor stretch that a lady in front of us was doing and it looked like a good idea so I did it too – bad idea! 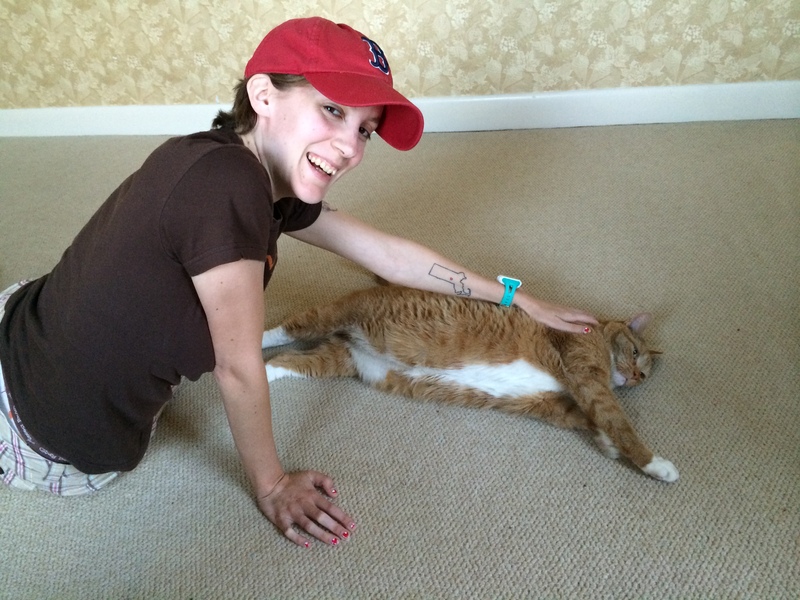 I had never done that stretch before and have no idea if I was doing it properly, but I ended up – unbeknownst to me at the time – pulling my right hip flexor and and wrenching something in the left side of my lower back. Silly Dana… this is why we don’t do new things right before a race!! Speaking of new things for a race… I went against protocol and was wearing new shoes and new socks, as well as a new shirt (but I wore another shirt under it that I had worn before). The shoe thing I didn’t think was too bad… I had worn them walking around the day before and already knew that they were shoes that would feel okay, and they did. 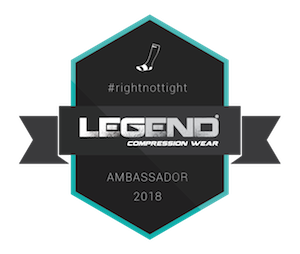 I decided to debut my ProCompression socks in hopes that they would hold my shins together, and for the most part they were fine, minus a few blisters. Anyway, back to the race. The 10K course was basically two laps of the 5K course and both races started together. Colin and I started near the back of the pack, so we ended up having to dodge around walkers (why do so many walkers always start so far up in the pack?!) as well as dodge the strollers that came tearing past us because they started at the very back and were so much faster than us. 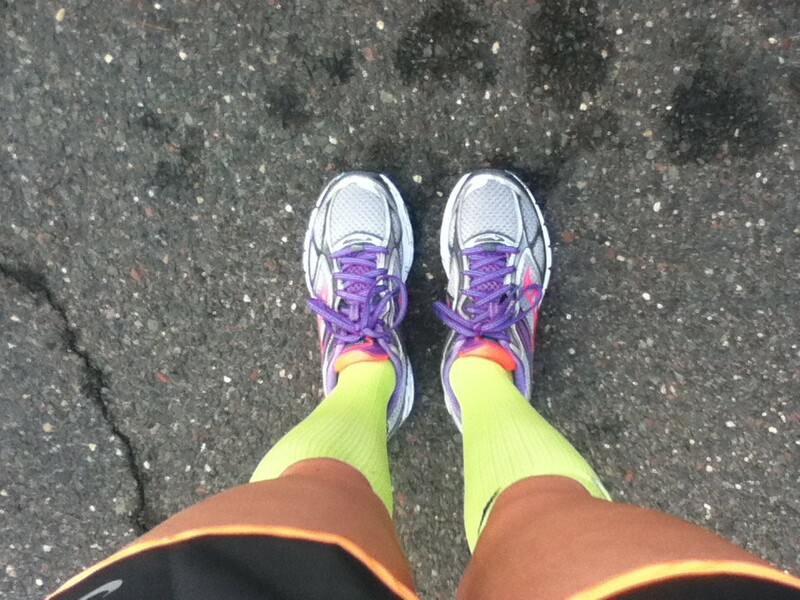 The first half-mile or so felt great… it felt awesome to be running again and my shins were behaving themselves. However, once I thought Hey, my shins feel okay! I totally jinxed myself and they both started hurting, especially righty. My right hip flexor hurt a bit too, so after being giddy about feeling great I was suddenly limping a bit and feeling dejected. Colin and I purposely ran slowly to ensure that we’d be able to complete the full 6.2 miles, and after averaging 10:30 for most race miles, the high 11s and low 12s seemed incredibly slow, and yet felt faster than I wanted to be moving! The first half of the race was rough with my shins and hip flexor protesting so much, and it was really tempting to veer off around Mile 2.5 to join the 5Kers. But we pressed on, taking the path less traveled as the 10Kers thinned out a lot by that point. As we rounded a corner to begin our second lap of the course, there were hardly any other runners around us, and the crowds had all left to go to the finish line. In a way it was nice, because we no longer had to dodge around people, and I put my iPod on sans headphones so that we could both listen to my running tunes. 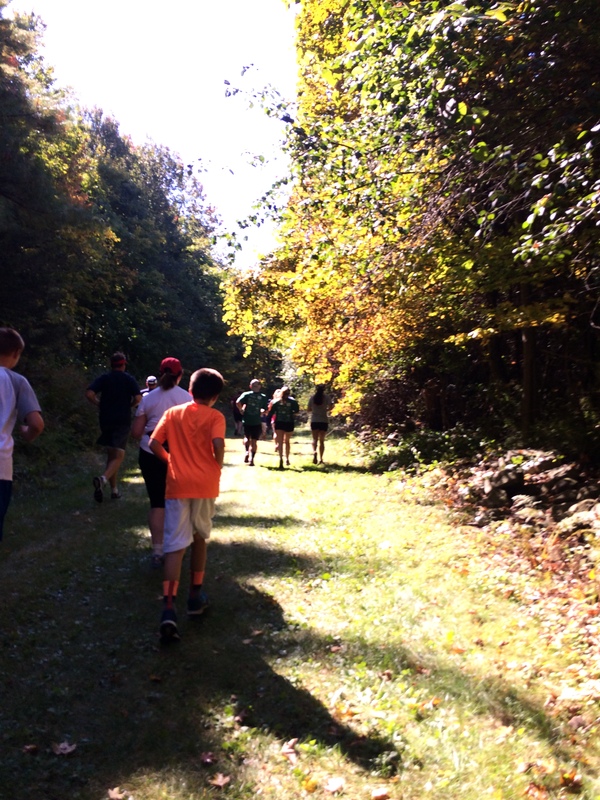 Around the time we passed Drew, a little after the 3-mile mark, I suddenly realized that I felt okay again. My shins had abruptly stopped hurting, and my hip flexor only hurt sporadically. I also felt like I had all my energy back and that, coupled with realizing that I felt great, spurred me on to pick up the pace a little bit. Or maybe it was the music. Either way, I became sure that I’d be able to finish the 10K after having doubted it just a mile back. I’ve noticed during long runs and speed work that the workouts tend to get easier the longer I run, so maybe I’m not warming up properly and the painful beginning of this race was my warmup? Who knows, but it lifted my spirits to feel good again! Even though I was feeling good once again, I realized that I had developed a sort of tunnel vision, or at least an intense focus. 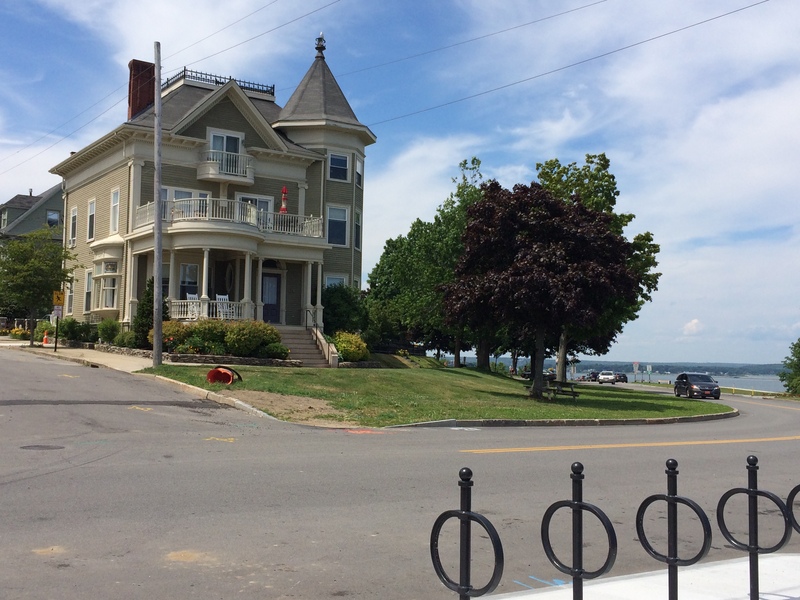 Maybe it was because we had already run one lap, but I stopped paying attention to all the pretty houses and scenery around us and just focused on staying in the rhythm I had found. I had planned to take a walk break at 1.5 miles, then 2, and by this point I wanted to keep running as long as possible. 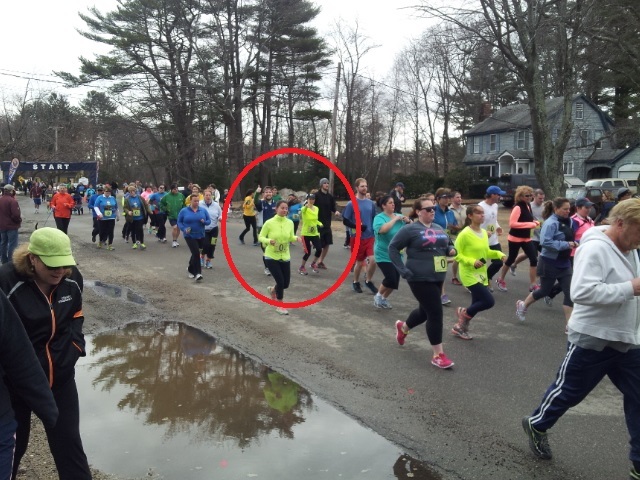 I was so focused, in fact, that I totally forgot to eat my chews, which I had planned to do around the 5K mark. Oops! I didn’t realize until Mile 4.5 or so, where there was a water station, so I grabbed a Gatorade instead of water to get my electrolyte fix. I was hoping for the same jolt of energy I had experienced during the Old Port race when I accidentally grabbed Gatorade, but didn’t feel anything. And, now that my mind was tuned in to how my body felt, I felt my legs getting heavy so broke out my chews anyway (just a few). 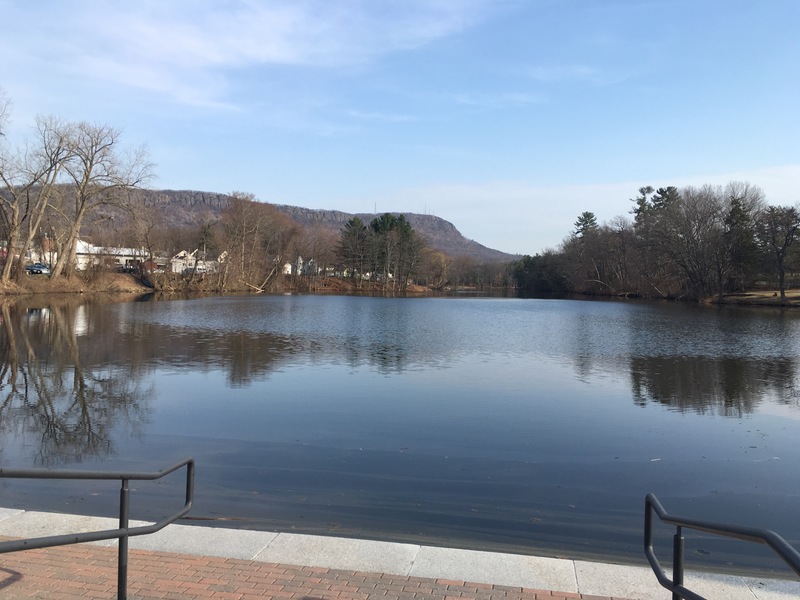 I was glad I did, because as we turned into the final mile, which was different than the course in the first lap, we were met with a hill that might have forced me to walk if I hadn’t refueled that little bit. After the hill we only had a bit of road left, then we ran down towards Wethersfield Cove. It was so nice to be plunged into the shady park after so many sunny streets, but I did not like the sudden transition to trail from asphalt. To get to the trail, we took a very sharp turn onto grass, and both my ankles protested violently… whether about the turn or the change in surface, I don’t know. After a few feet on the grass we hit a gravel trail, which kind of felt nice after the roads, but also threw my legs for a loop after they had gotten used to so many miles on asphalt. The trail was quite narrow too, and the people around us who had seemed spread out were suddenly bunched into a tight little group, or mini-pack as I kept thinking of them. At the end of 5Ks I usually have enough energy, depending on the race, to finish with a sprint, but I hadn’t expected that to happen in a 10K. However, maybe it was the last-minute fuel, but I wanted to finish fast, and the mini-pack clustered on the tiny trail was moving so much slower than I wanted. I started running like obnoxious tailgaters drive, getting a little closer than normal and weaving back and forth, looking for a way around, and when I spotted an opening I zoomed around everyone and took off, surprising Colin. 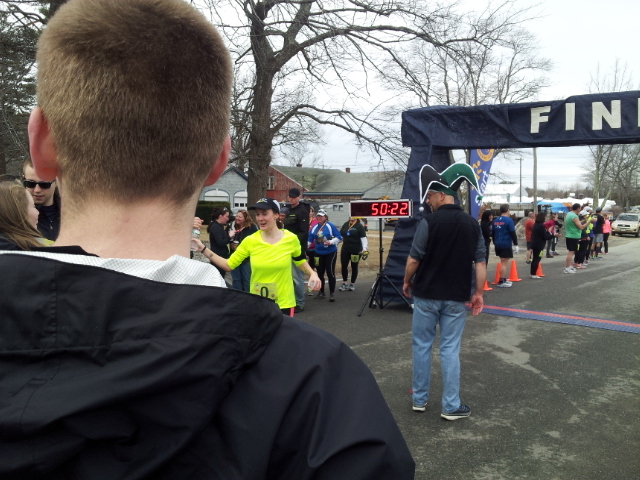 I vaguely heard some cheers and clapping as I approached the finish line, and I pushed it with everything I had left and passed everyone who was in front of me. I did it! I finished a 10K! I tried to stop but my legs needed to keep moving and I walked away from Colin and Drew like I was being remotely controlled and just kept going. I gratefully grabbed a water bottle that volunteers were handing out in the chute, and my legs carried me across the park over to the Dunkin’ Donuts booth to get a free sample of iced green tea. After guzzling the tea and some water in the shade (Drew and Colin had caught up by that point) we wandered over to the sponsor booths, hoping for some goodies. This was the downside of being slow and running the longer of 2 simultaneous races – all the 5K runners had finished, as well as the vast majority of 10K runners, so everything was picked over. There were some orange slices, a few tiny bits of bagel that had flies buzzing around them, and some fruit-and-nut bars that Colin tried and said were disgusting. Oh well. Despite the slightly anti-climactic feel of the post-race festivities (no swag, not many snacks left), I will say that I loved how they had results set up. Instead of printing out the results and posting them somewhere with people all crowded around making it hard to see, they had left the registration computers out and cued up to the results database. All we had to do was punch in our bib number and our results were displayed on the screen. I was very happy with how the race was managed – it seemed very well organized and all the volunteers were great! So, to wrap-up this giant ramble, I’m quite pleased with my race experience! 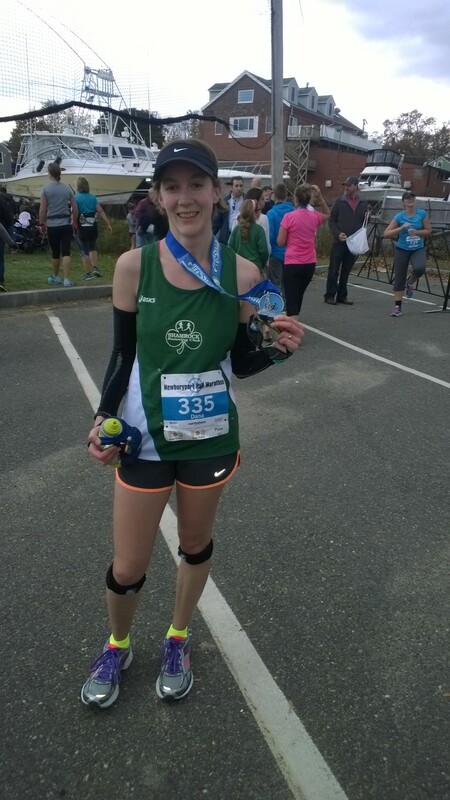 I’m chuffed to have finished a 10K, and to have run my longest distance – race or otherwise – to date, especially given that I didn’t have to walk except for a few seconds at a water stop. 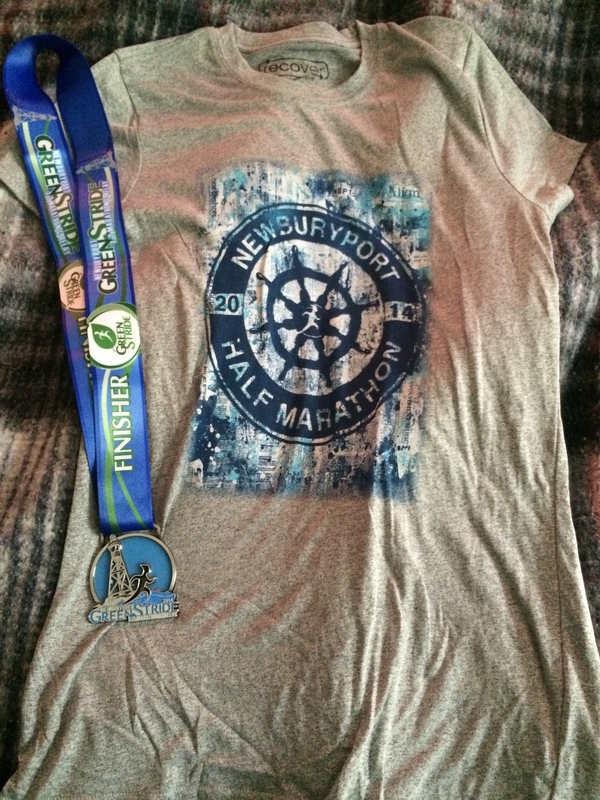 The Hartford Marathon Foundation put on a great race (though I was secretly disappointed that there was no bling to be had) and I’m glad I had the chance to explore such a cool New England town. It also felt good to support a cause like InterCommunity, though I was puzzled that they didn’t have a presence at the race at all (that I could find anyway, and I looked for them specifically). I do wish that I hadn’t tried that hip flexor stretch… there’s a knot the size of a fist lodged in my lower back, but other than the usual post-race soreness in my legs (and hatred of stairs) I feel great! No pain in my shins or anything. Huzzah! Last year, we arrived early Saturday afternoon after fighting traffic on I-95. We stayed at the La Quinta hotel, which was 2.5 miles away from not only the race location but also the fun areas of downtown. After picking up our race packets at the Maine Running Company [now a Fleet Feet], we wanted to have lunch at Duckfat but there was a wait of at least an hour, so we settled for a brewpub down the street. After wandering Commercial St (the main drag by the ocean) and trying not to melt in the heat, we had a delicious sushi dinner at Benkay, and then went to Trader Joe’s by our hotel to pick up provisions like bananas and bottled water and a cart full of local beer. We awoke super early the next morning, arrived at the starting line about an hour before gun time, ran our race, drank some beer at the post-race party (before 9am! 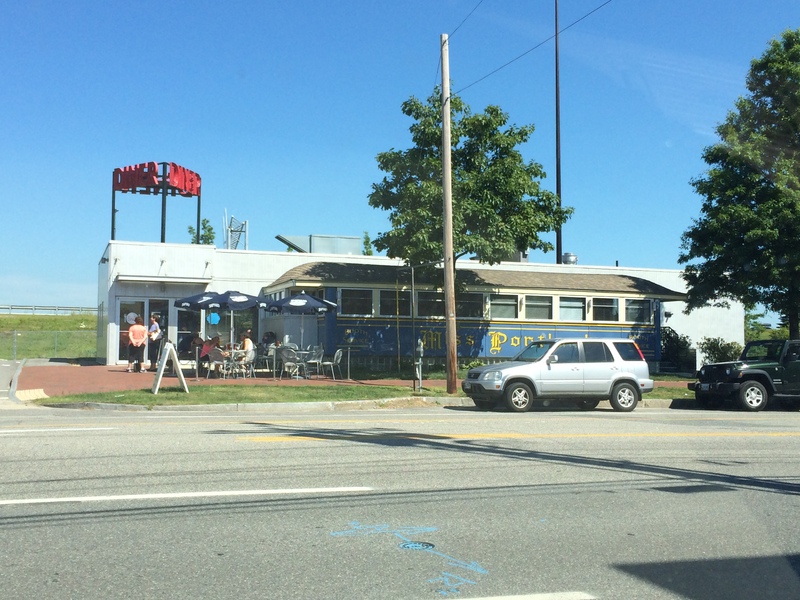 ), showered, then hit the road home, stopping for brunch at the Maine Diner and hitting up the Kittery Outlets on the way. It was a lot crammed into two short days, and we were really looking forward to the extra time this year to relax and explore the city. I had splurged a bit on a GPS watch the weekend earlier, and was giving it a trial run during the trip. 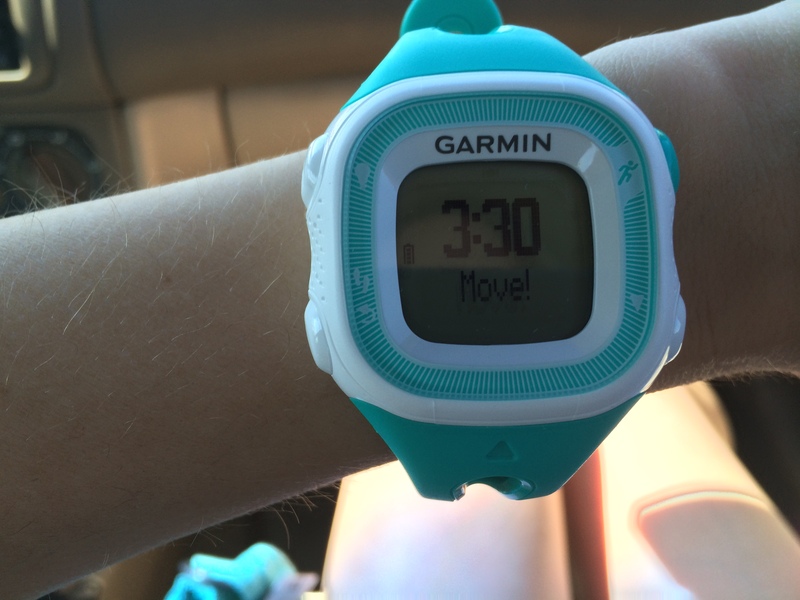 After a lot of research, I opted for a Garmin Forerunner 15. It seems really similar to the Forerunner 10, except it supposedly has a battery life of 8 hours while in GPS mode, as opposed to the Forerunner 10’s GPS life of 5 hours. My reasoning: if I ever run a marathon, I’ll likely take longer than 5 hours to finish and I’d hate for my watch to crap out before I cross the finish line. Also, the 15 has a built-in fitness tracker and counts your steps each day. After trying out the Breeze app and ultimately deciding it wasn’t useful because I don’t have my phone on me 24/7, I thought having a tracker that I wear would be more accurate and informative. Where was I before I went on that gearhead tangent? Oh right. Portland. 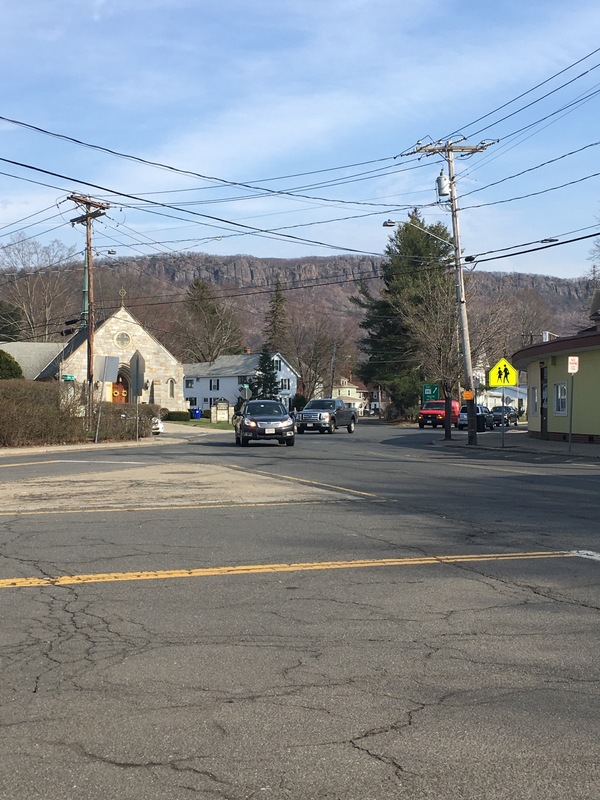 We arrived around 5.30 and took our time driving up Munjoy Hill to where our Airbnb was. 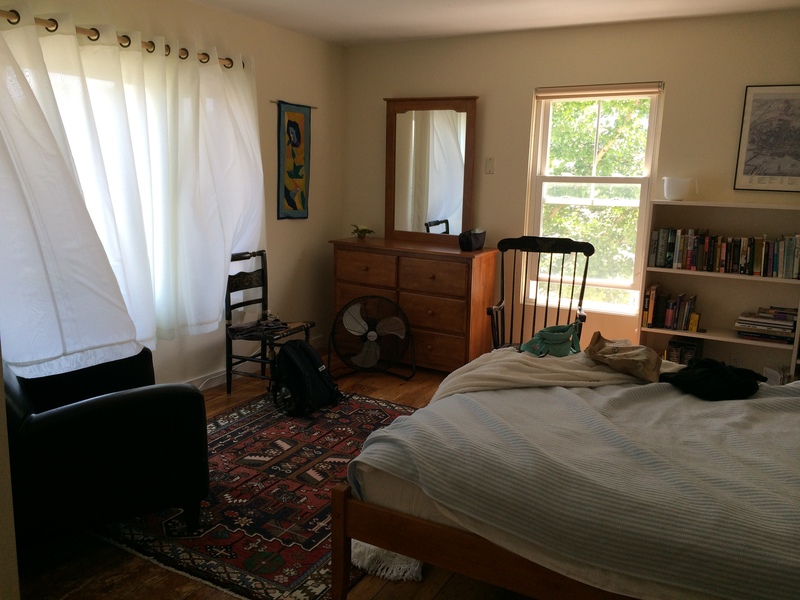 Drew’s mom is a big supporter of Airbnb, and I had been curious to try it out. 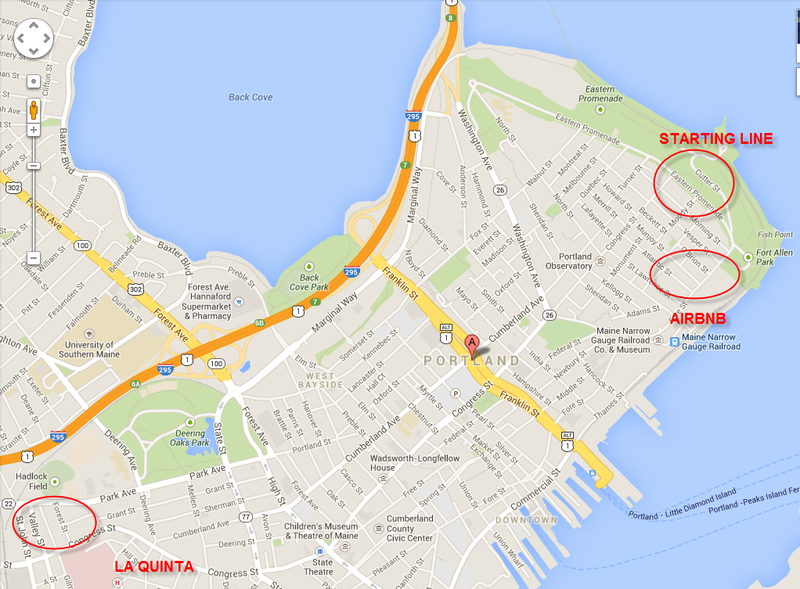 Like last year, the hotels around the Old Port neighborhood filled up super fast after race registration opened, and the closest we’d be able to get to the East End starting line was the same La Quinta as last year… about 3 miles away. 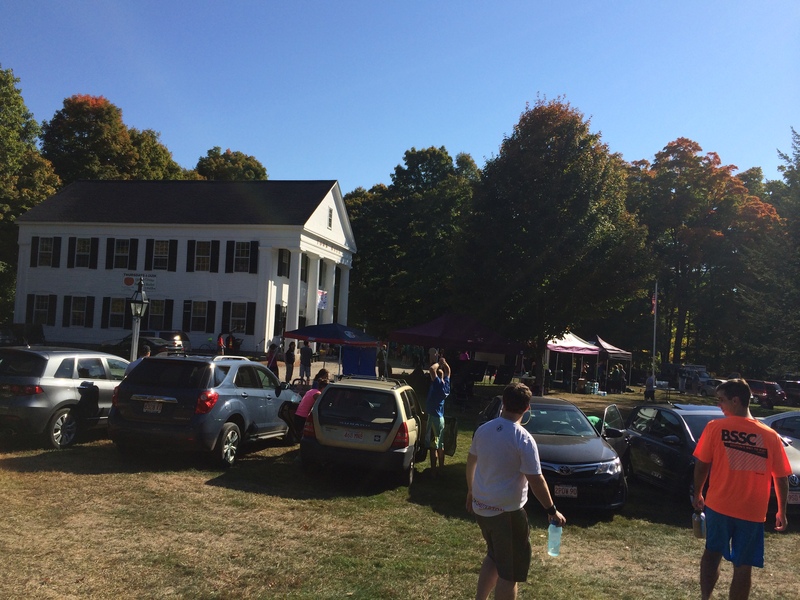 Just for yucks I started browsing Airbnb and found a cute little place just steps from the starting line at the top of Munjoy Hill. One of the bedrooms. SO much nicer than the hotel! Our host told us about Rudy when we checked in, and said that if we were allergic or didn’t want his company just to close the door to the hallway and he wouldn’t bother us. Drew and I both love cats, and Colin seemed to have a good time playing with Rudy using his dangly bookmark, so I think I can safely say that we all enjoyed our furry co-host. Unable to resist their dessert menu, we added an order of doughnut holes to share. They were incredible… soft and lovely with just a hint of citrus and topped with powdered sugar. They were good enough that we seriously discussed going back again just to get dessert! After dinner we figured we’d wander the city a little and maybe stop by a bar. 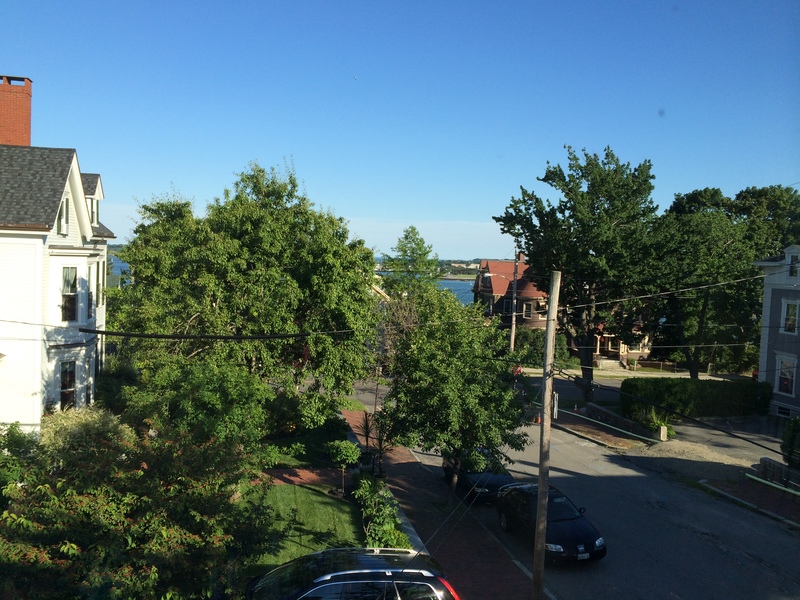 Whereas last year we spent most of our time on Commercial St by the water, this year we stuck to more “inland” streets (in quotes because we were still only a few blocks from the ocean). 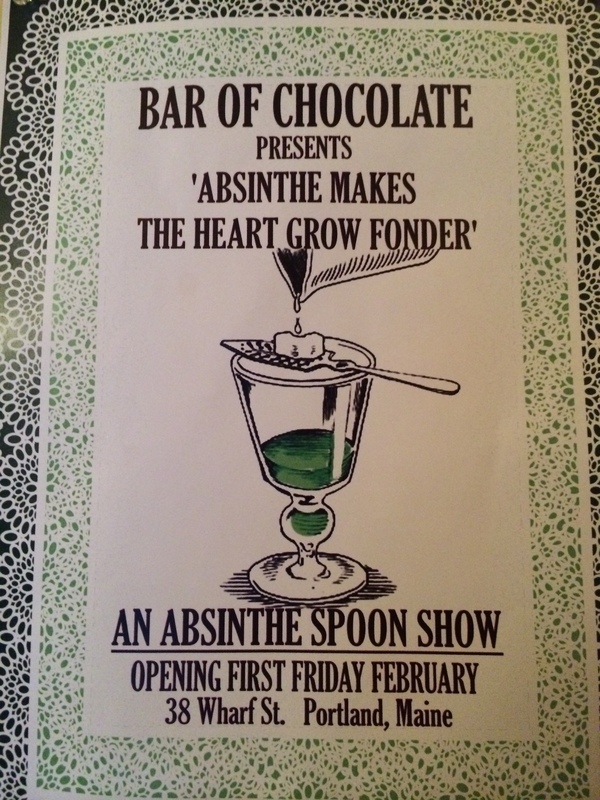 Having recently been in town for a friend’s bachelorette party, I remembered a really good bar/dessert place we’d visited nearby called The Bar of Chocolate. 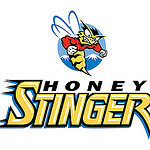 The lads heartily agreed that they liked the name and off we went. It wasn’t too busy when we got there so we situated ourselves at the bar and drooled over the menus placed in front of us. It was unfortunate that we had eaten so much at Duckfat because their dessert specials for the day looked incredible! 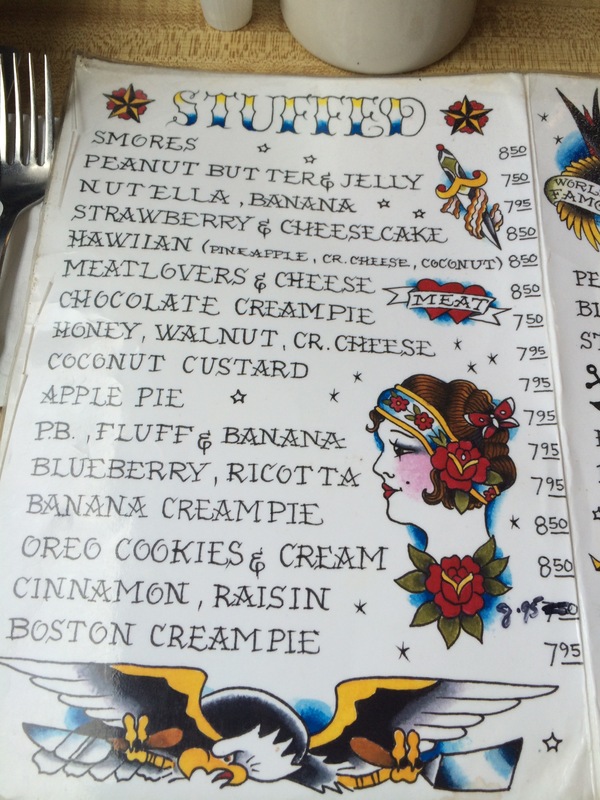 Especially the strawberry-rhubarb crumble. We were all way too full, so we opted for drinks and decided we’d see if we were any hungrier after. Sadly our stomachs didn’t cooperate and no room was created for extra dessert, but we did spend a good two hours at the bar just chatting and laughing and, in Colin’s case, talking with the bartender about Ireland. It was close to 10pm when we left and the streets were alive, at least in that downtown area. Bands were playing in beer gardens, buskers were performing on corners, and we could easily see what a young, vibrant city Portland is. For a Saturday morning there wasn’t much of a wait and we were browsing menus in our booth within 10 minutes of arriving. Apart from our hostess who looked like she hated life, all the other staff were friendly and helpful and our food came pretty quickly after ordering. 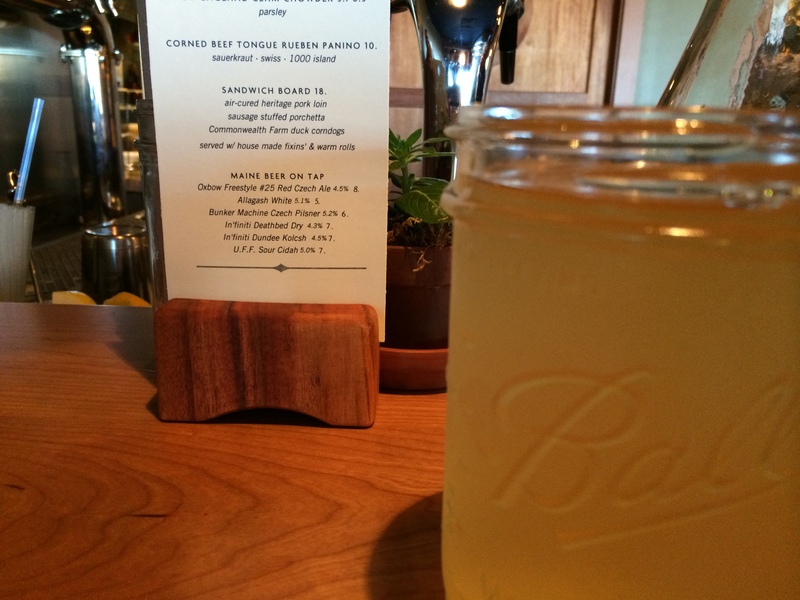 Since we were in Maine, I felt it only right to order something with blueberries. 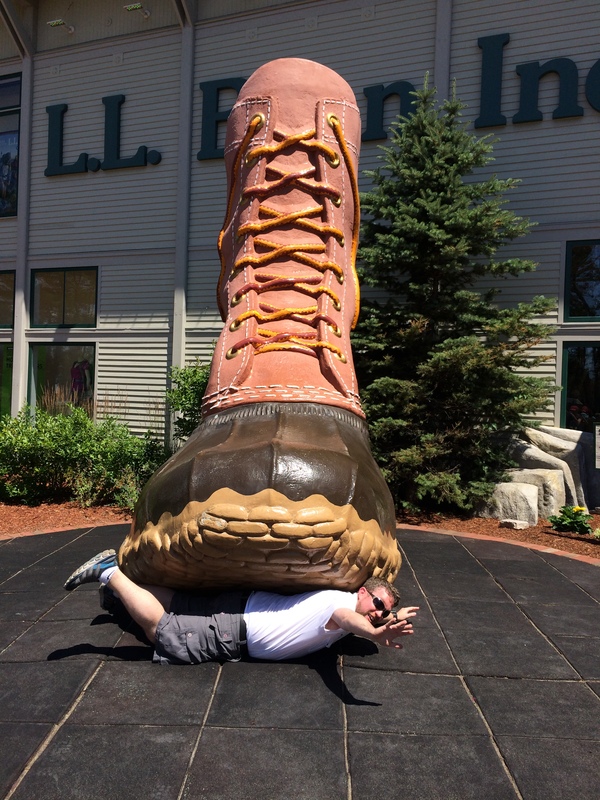 I went with the (giant!) blueberry pancake with real maple syrup, plus a scrambled egg on the side because I thought protein would be a good call before the race. 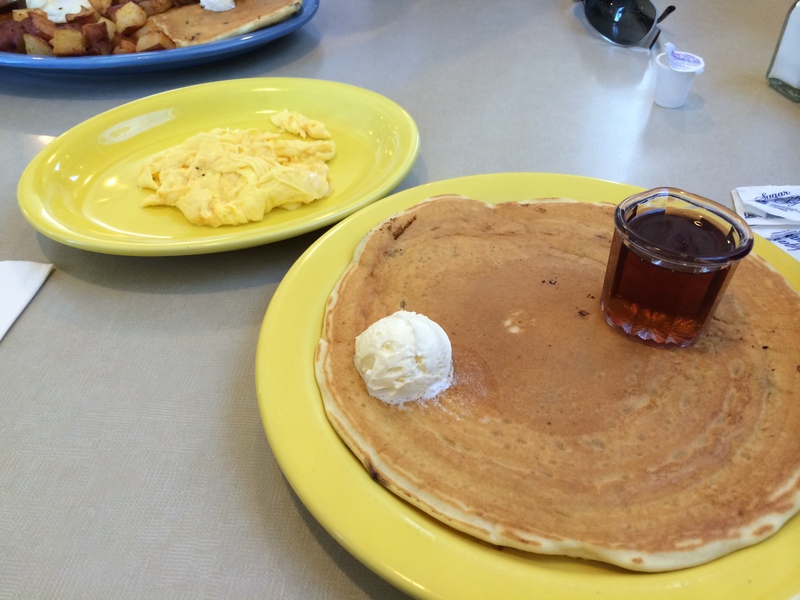 When it arrived, Drew exclaimed that the pancake was bigger than my face. And indeed it was! It might just have been the best blueberry pancake I’ve ever had. Colin’s breakfast came with two smaller versions and he thought the crust tasted sweeter than usual, even without the syrup. I don’t know how they make them, but they’re delicious! The only part of my breakfast that was disappointing was the iced coffee. 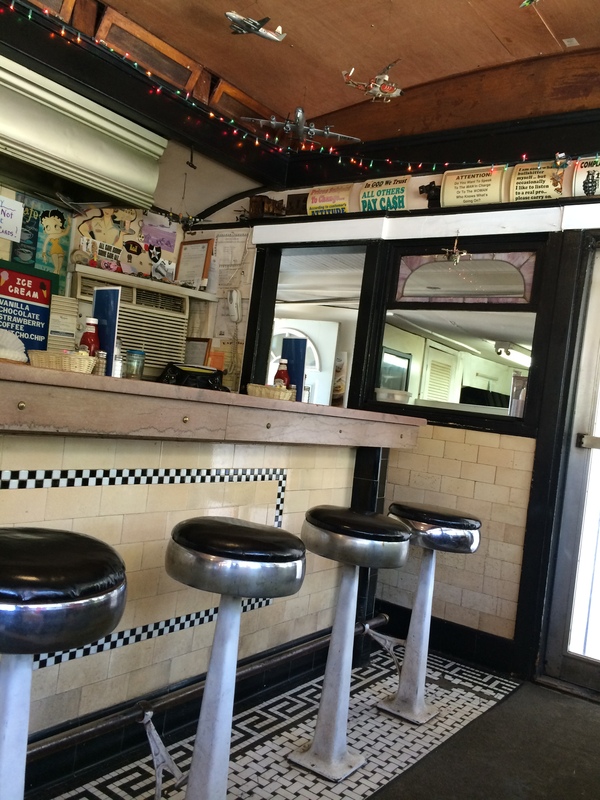 The lads loved their food, and the hot coffee they both ordered seemed up to snuff. We poked around in some outlet shops (there’s an “outlet village” across the street from Bean) and introduced Colin to the wonder that is Orange Julius. (Since when does Dairy Queen own Orange Julius?! Whatever… I was happy that I could have one… it had been years since my last!) By total serendipity, we also stumbled on a sign advertising that night’s performance in Bean’s little outdoor concert area – Josh Ritter. Colin is a big fan and he was completely blown away that one of his favorite artists was doing a free show that night. Bonus! We wandered around the park for a bit and Colin and I reminisced about running up the giant hill during the 5K last year. We were both so glad we wouldn’t have to do it again this time around! 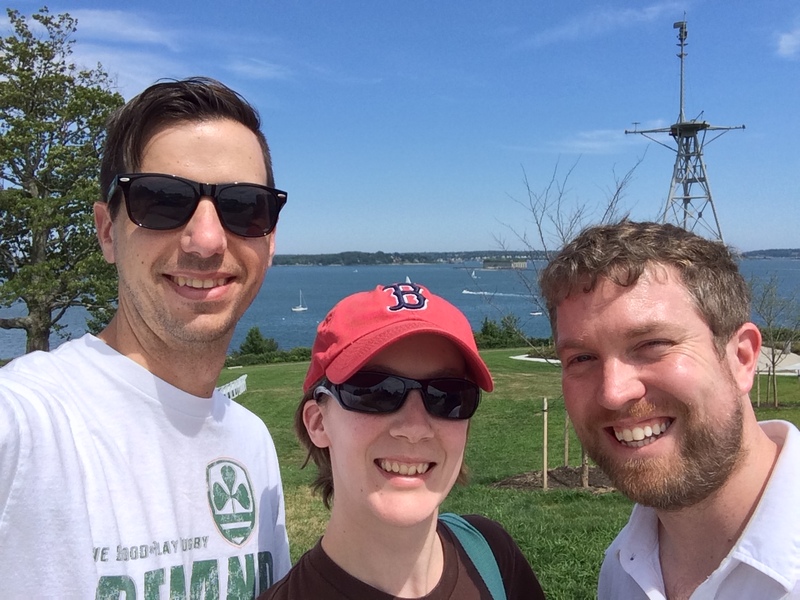 Even though there was still about an hour before kickoff, we meandered our way off the pier and over to the Sebago Brewing Company, the brewpub we had settled on for lunch last year after Duckfat was too crowded. We had enjoyed sampling their beers on their little patio last year, and vaguely remembered TVs inside, so we figured it would be a safe bet for the game. We nabbed seats at the bar right by a TV and settled in. I was really intrigued by their specialty cocktails menu, but Drew forced the “mocktail” menu into my hands with a look on his face that said “You need to hydrate!” Sigh. Water and a raspberry lime rickey it was. 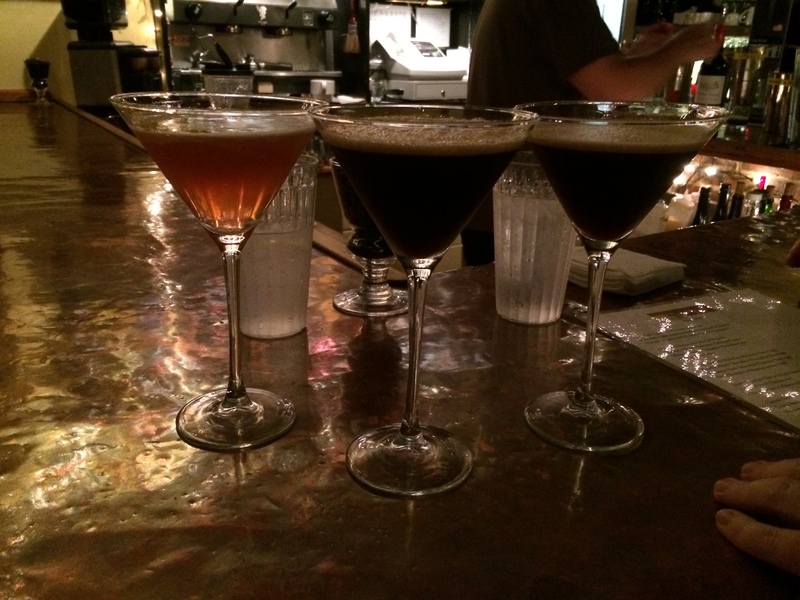 By that point, Colin had pretty much decided that he wasn’t going to run with me the next day, since his ankle was was still bruised and tender from his fall on Thursday, so he didn’t hesitate to order a sampler flight. The lads enjoyed their beers (especially the doppelbock), I loved the lime rickey… as well as a cheeky dragonberry mojito, and the sweet potato fries were lovely, even though it did take us more than 30 minutes to get them after we ordered (they weren’t busy at all). 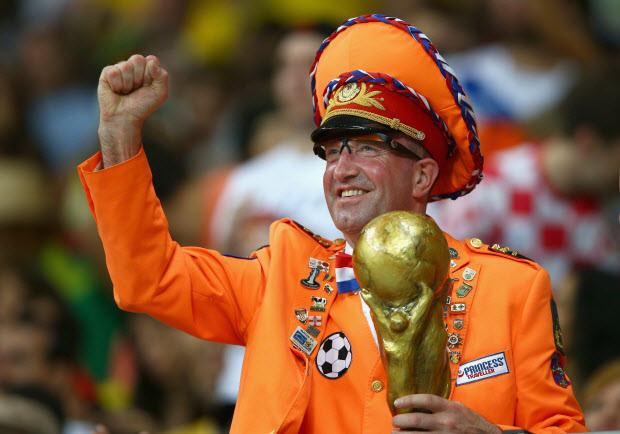 And, to top it all off, the Netherlands won! Oranje!! By the time the game was over it was just about 6, and Colin wanted to go back up to Freeport to see Josh Ritter, who was going onstage at 7. However, we were still full of beer/cocktails and sweet potato fries – and absolutely freezing after sitting in the air-conditioned bar for so long – so we plopped down in a sunny spot on some grass to thaw out and give our stomachs time to catch up. (SO much food was consumed on this trip!) Then it was time for our return trip to Benkay, the sushi restaurant we had enjoyed so much last year. We were still cold so Drew ordered hot sake and Colin and I both got hot tea (Colin was waffling again about whether or not to run). I don’t know if Benkay had changed their menu or sushi chefs or what, but I was really disappointed by both the selection and the food this time around. The edamame was soggy, the selection of maki didn’t really tempt me even though I remembered last year’s being awesome, and the rolls I did get had overly chewy seaweed wrappers. The lads didn’t seem disappointed though, so maybe I was just being too picky. We rolled ourselves back up the hill to our Airbnb and while Colin waited for his phone to charge so he could use his GPS, he taught us how to play one of his favorite card games. 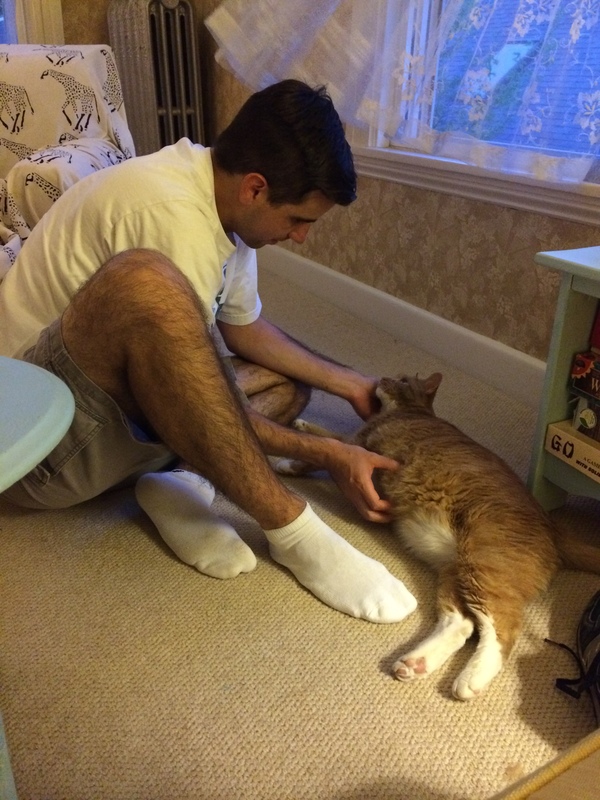 I really loved having the little sitting room in our Airbnb; it was a relaxing, cozy place to hang out, and Rudy even came in to hang out with us. Colin eventually headed off to Freeport while Drew and I read and charged up Simon. The Summer Festival was still going strong and the wind was carrying the music right up into our windows so I knew it was probably going to be another night of difficult sleep. At least I was ready for it this time! Not only did the sunrise wake us early the next morning, but the PA announcer at the race did as well. Registration started around 5:30, and so did announcements apparently. 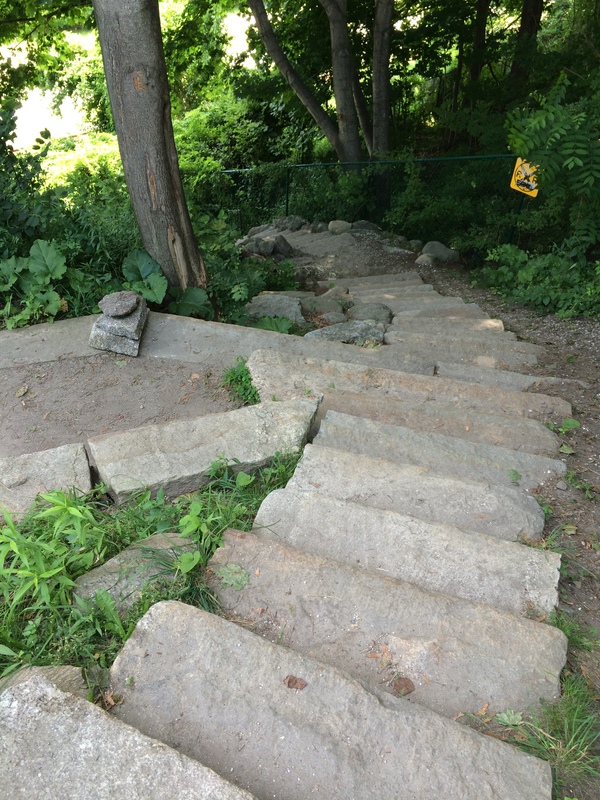 (Man, sound really travels up Munjoy Hill from the piers!) I do remember hearing PA man say “It’s probably a little cooler than most of you were expecting” which made me really happy; after last year’s heat fest, I was ready for an earlier, cooler race. Thanks to the excellent location of our Airbnb, we had a much less stressful morning getting ready and making our way to the starting line, a journey that took all of 3 minutes. A full recap of the race itself is coming soon! 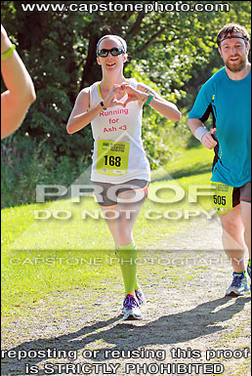 Colin eventually decided not to run, so my pointing, posing self ran it solo. 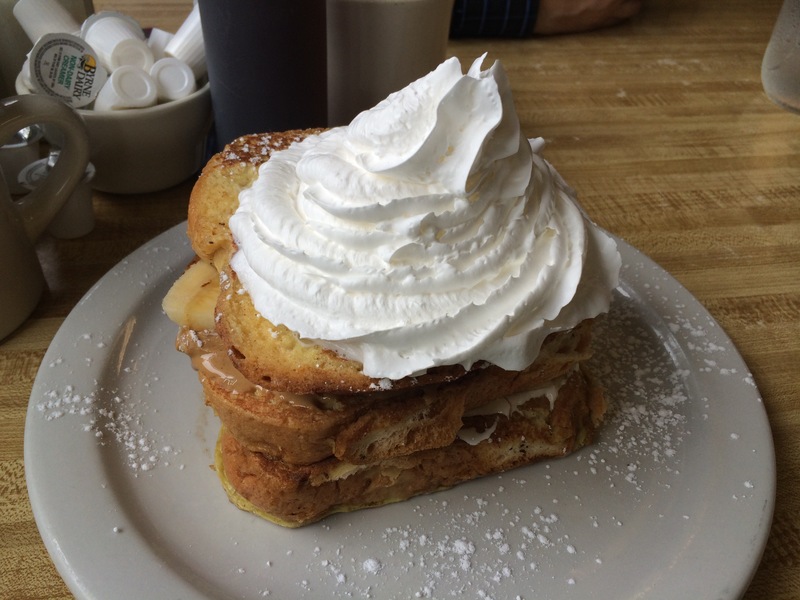 After racing, showering, and checking out of the Airbnb, we drove across the city to try out a breakfast place that had come highly recommended from a friend – Bintliff’s. 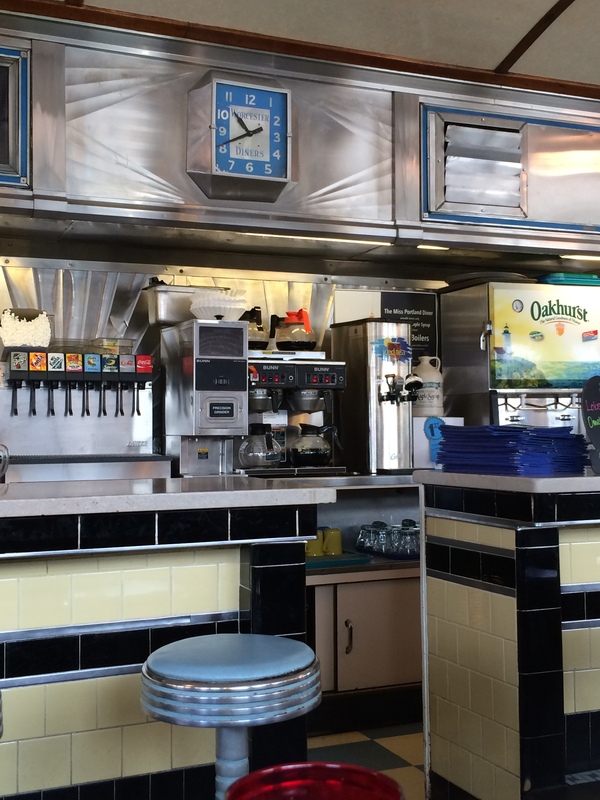 Unfortunately, the whole process of washing off sweat and sunscreen and squaring up with the Airbnb host meant we weren’t arriving until 10ish, and the line for Bintliff’s was out the door and down the block. Luckily we knew a place. Back to the Miss Portland we went! A child’s meal, perhaps… a delicious meal, yes. After breakfast and a trip to the Trader Joe’s across the street to stock up on some local beers, it was time to say goodbye to Portland. 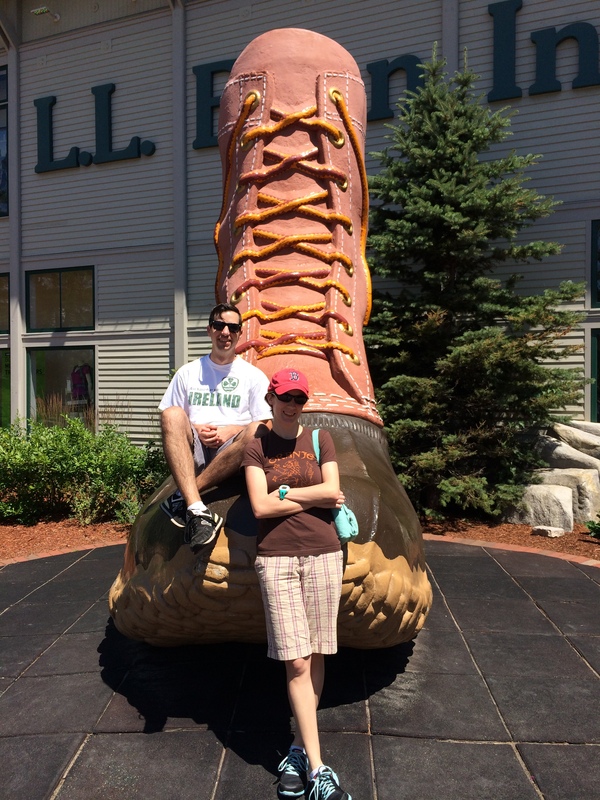 We did make a stop in Kittery again for some outlet shopping (sales at Under Armour and 50% off the entire Puma store – yes!) and a Starbucks stop, then it was Massachusetts ahoy for a viewing of the World Cup final in the comfort of our own living room and an early night in our own cozy bed, in our quiet room with the blackout curtains. Ahh, home. 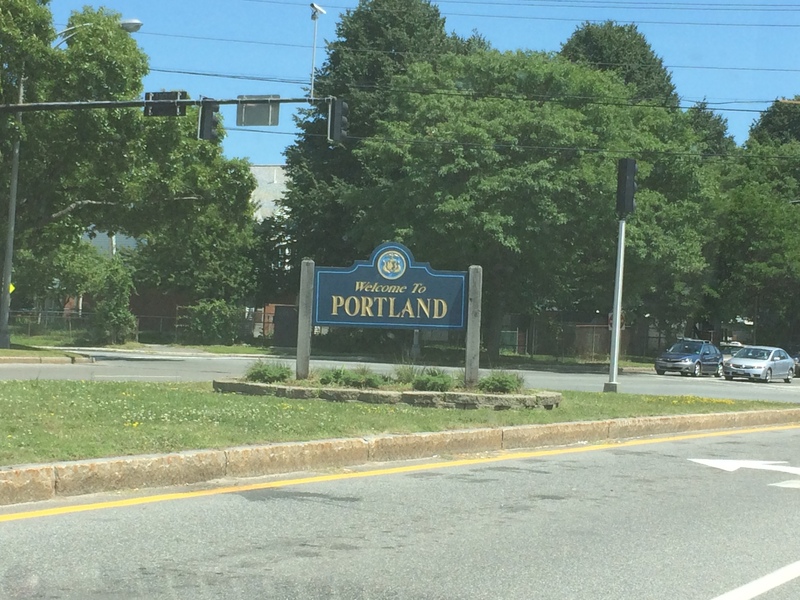 Have you ever been to Portland? What are your favorite places to visit there? Do you have a nearby(ish) city you like to road-trip to? 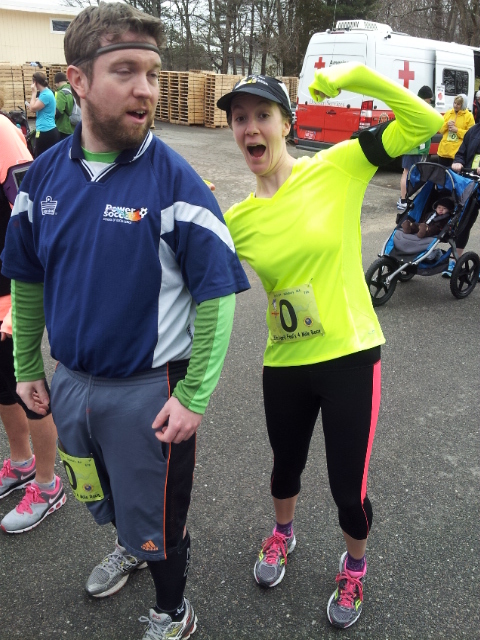 There we go… pre-race power poses. And a duck face, apparently. 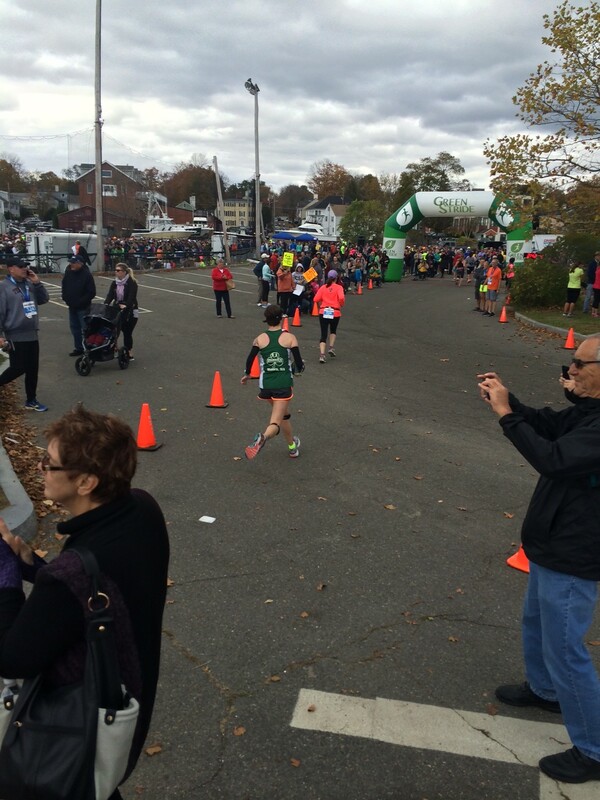 Recap: I think I’m still riding the runner’s high from this race. Neither Colin nor I had ever run farther than 3.1 miles before yesterday, and after our not-so-great training run the Thursday before (more on this later) we weren’t sure we’d be able to go all 4 miles. Though honestly, I’m not sure what we were worried about… I ran my entire first 5K without ever having gone more than 1 mile at that point, so an extra .9 miles shouldn’t have been such a big mental hurdle. But it was, and we cleared it with the most awesome figurative jumps ever. First, the dodgy training run. Thursday was actually pretty warm for the first time in forever (upper 40s! 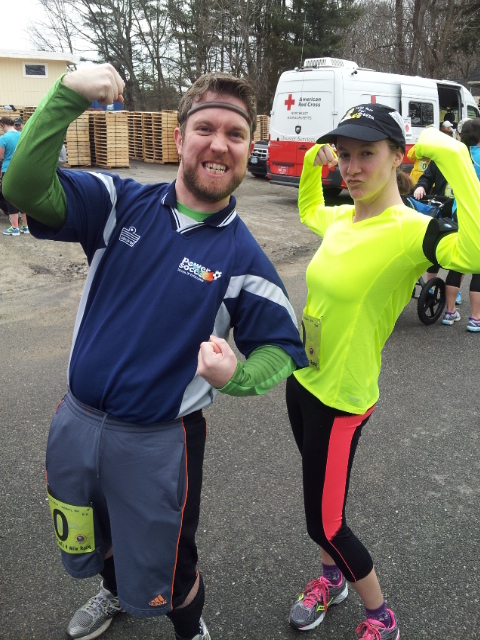 ), and I managed to convince Colin to come along to the Shammies’ weekly 3-mile run. I had never done the Thursday run before since I was nervous that, being as slow as I am, I’d get left behind by the rest of the group and would get lost on the new-to-me route. I figured if Colin came with and we got left behind, at least we’d be lost together. It turns out I didn’t have to worry… there were two other runners who had a pace similar to ours, so the four of us stuck together for 2.5 of the 3 miles. Colin’s Achilles had been bothering him again, and my shin splints were acting up a bit for the first mile or so, but I ended up having to stop for another reason altogether. I learned the hard way that I shouldn’t have dairy before running, and thought I was going to pull a Lineker on the side of the road. Luckily that didn’t happen, but it did make for a very uncomfortable and discouraging run/walk. Colin and I decided to run this race very slowly, not wanting to aggravate our recent niggles and also hoping that rationing energy might help us run the full 4 miles. It was actually pretty tough trying to keep our pace slow during the first mile… I felt almost like I was doing comedy running, or exaggerated power walking, and I had to keep reminding myself to keep it slow. It made a difference for our niggles, though; Colin’s Achilles didn’t bother him much at all, and my shin splints were only vague hints of pain rather than full-on like they have been. And for the first time in a long time, we were running slow enough that we could carry on a full conversation without being out of breath and struggling. Probably the best effect that came from taking it so slow is that, when we made it to the 5K mark, we both felt like we could keep going for quite a while, and knew for sure that we’d be able to keep running the rest of the race. Colin even declared that he was enjoying running for the first time ever. I was so pumped about that! I’d had a few happy running epiphanies but Colin had yet to get any enjoyment out of it, so it made me happy that he finally liked something about running. Huzzah! 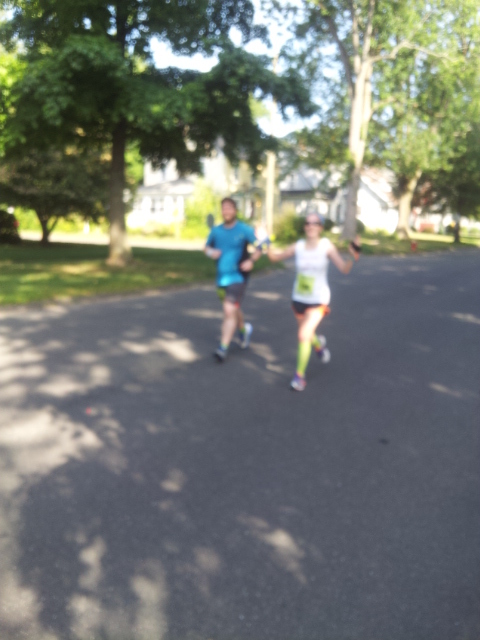 As we rounded the corner for the last .1 mile of the race, Colin decided he wanted to finish strong. He accelerated and just kept going, and I had to sprint at top speed to try to stay with him (MapMyRun lists our best pace at 4:51 min/mile… holy cow!). As we neared the finish line, I could vaguely make out the guy with the bullhorn cheering us on, getting all excited about how fast we were going and yelling “faster! faster!” and the spectators and other runners by the finish were all cheering for us too. 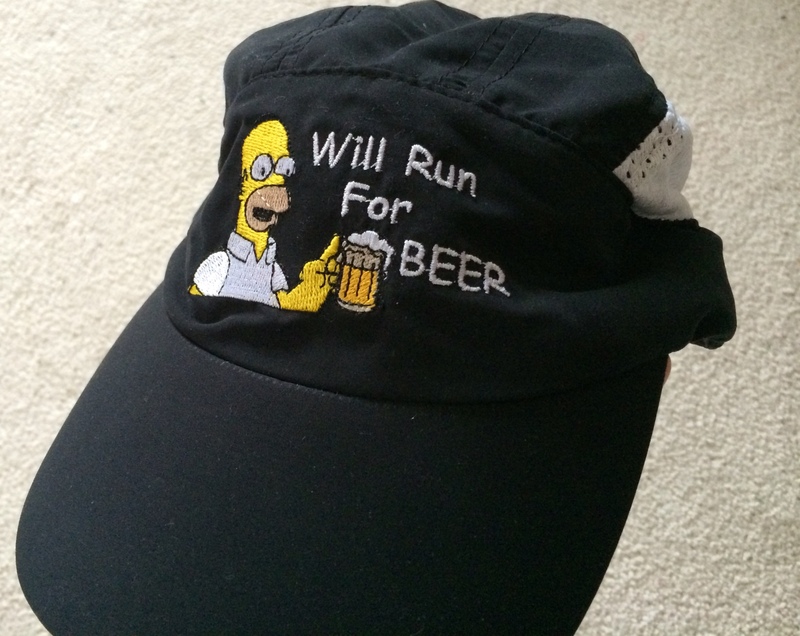 I would have soaked it all in and let it carry me victoriously over the finish line if my silly beer hat hadn’t been catching the wind and trying to fly off my head (d’oh! 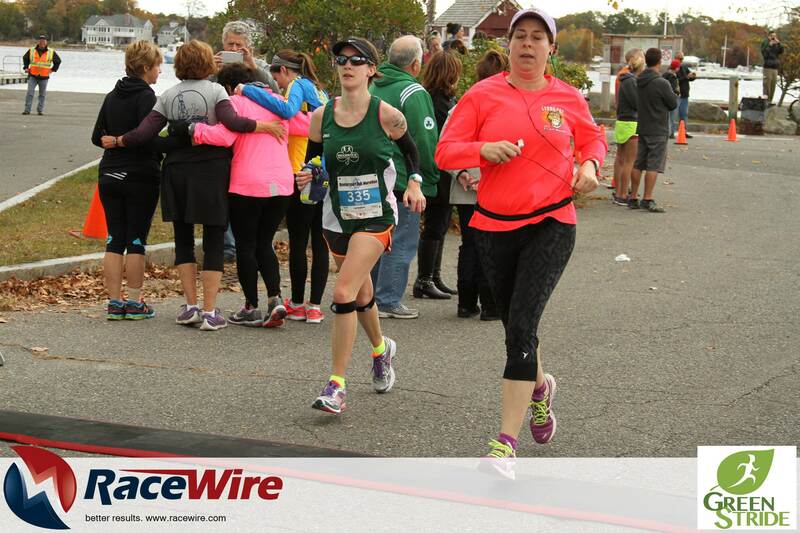 )… my finish line pictures will probably show me sprinting with my head down at an awkward angle, hands grasping at the brim as I tried to keep it on. 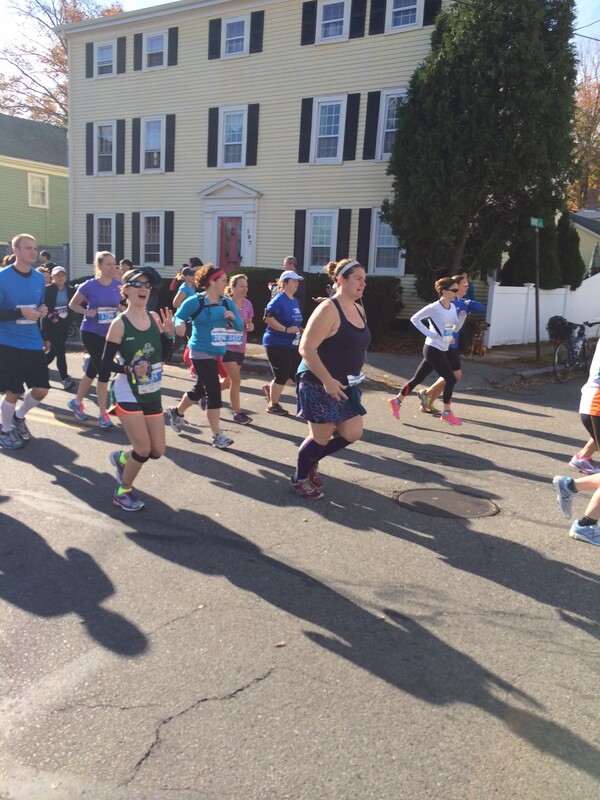 I did manage an arms-aloft pose as I crossed the line, though. 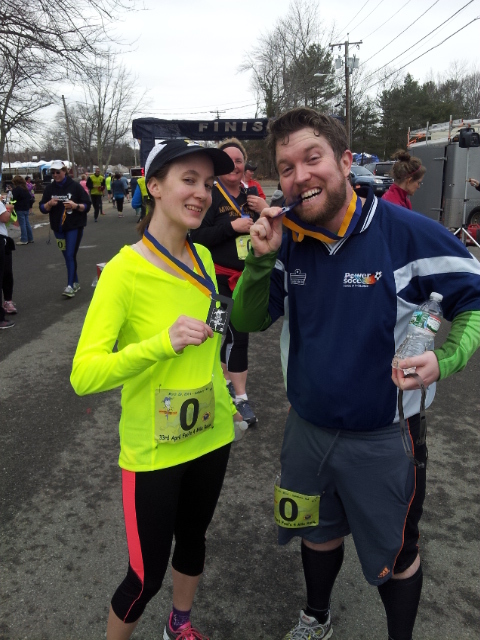 We were both so giddy afterwards, wearing our medals proudly and totally stoked that we successfully ran 4 miles and had enough energy to give it all we had at the end. That probably means we could have pushed it harder during the rest of the race, but it was so enjoyable taking it easy that I don’t even mind knowing that I could have gotten a better time. We had fun, and Colin enjoyed himself while running for the first time, and I wouldn’t trade that for a minute or two! Plus, the great thing about running a new distance is that your time is an automatic PR. Wahoo! 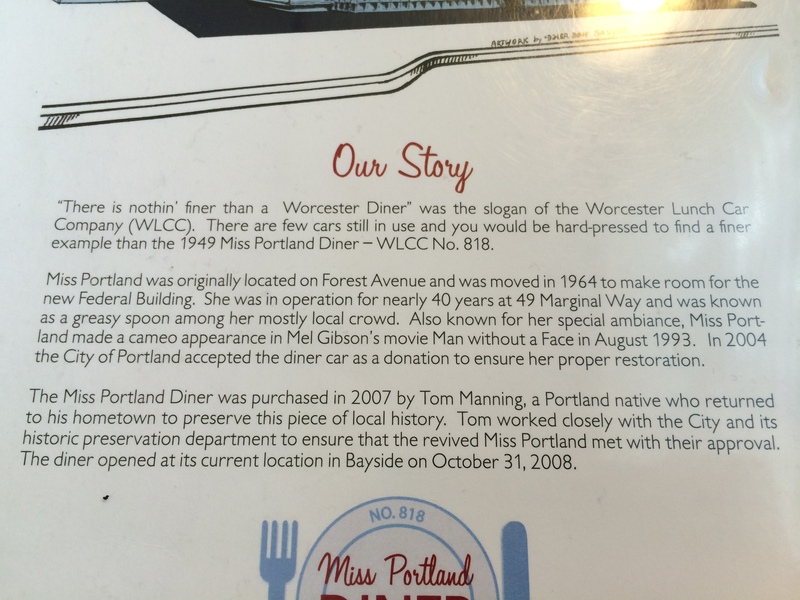 It was a diner with a lot of history (which was written out on the back of their menus… I love that), and it was in a town that shares a name with my beloved childhood piano teacher, but all-in-all the diner was a disappointment. 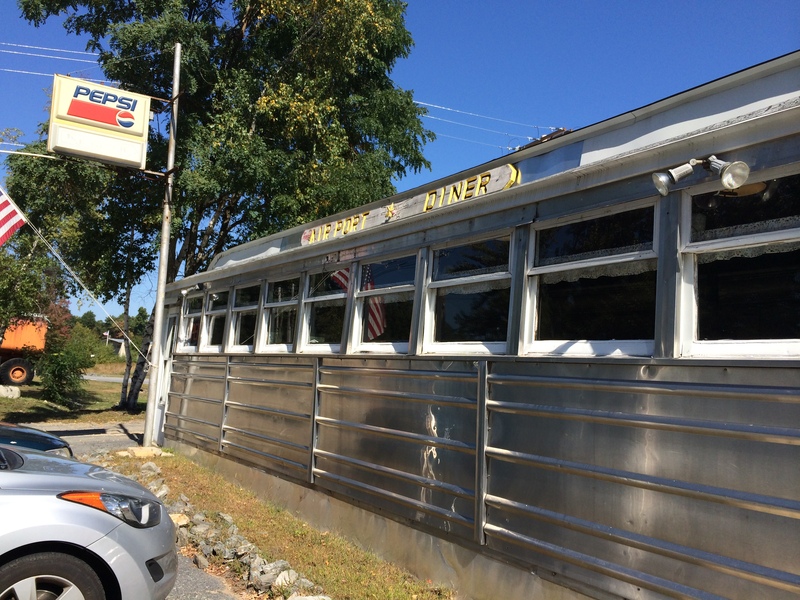 The food wasn’t great and the coffee was nasty (and I love crappy diner coffee!) 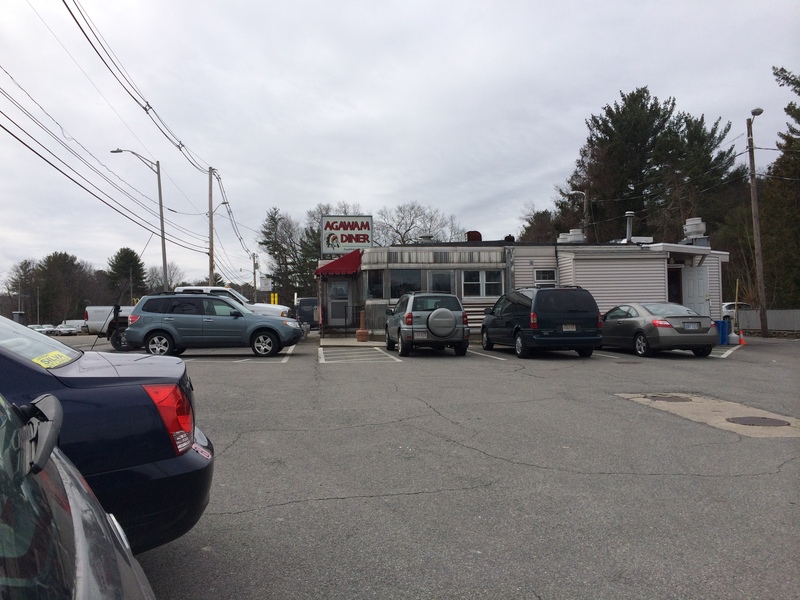 but we tried not to let the sub-par diner experience ruin what was an otherwise fantastic morning. Now that I know I can run 4 miles, I can’t wait to make a habit out of weekend long runs so I can watch our mileage start to tick upwards!